For Northamptonshire's butterflies 2018 has been a memorable year for many reasons. 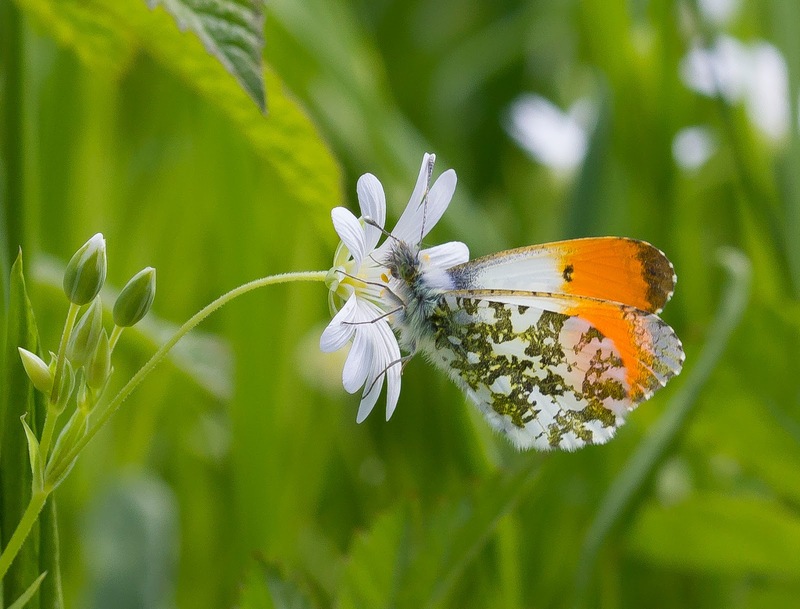 Not only did we have two national projects in the county but it was also an exceptional season for many of our butterflies. When I first became interested in the serious study of butterflies I'd often hear stories of huge groundings of Purple Hairstreaks, explosive Black Hairstreak years and numerous rare aberrations and colour forms which at the time such spectacles seemed to be confined to the history books so to witness many of these events first hand in 2018 made the year an extraordinary one to say the least. It's hard to say what made the year such a good one for many of our species and the consensus now is to think it's actually a number of factors with perhaps the climate being the biggest. Weather wise the year started quite mildly until exceptionally cold air blew in from the east (the "Beast from the East 1 and 2") in February and March and then after a slightly unsettled start to Spring the sun came out in May and with the exception of the occasional off day pretty much stayed out until mid September! This of course not only led to ideal conditions for the butterflies but also some of the best conditions (unless trying to separate Small from Essex Skippers) to view and record them in too. 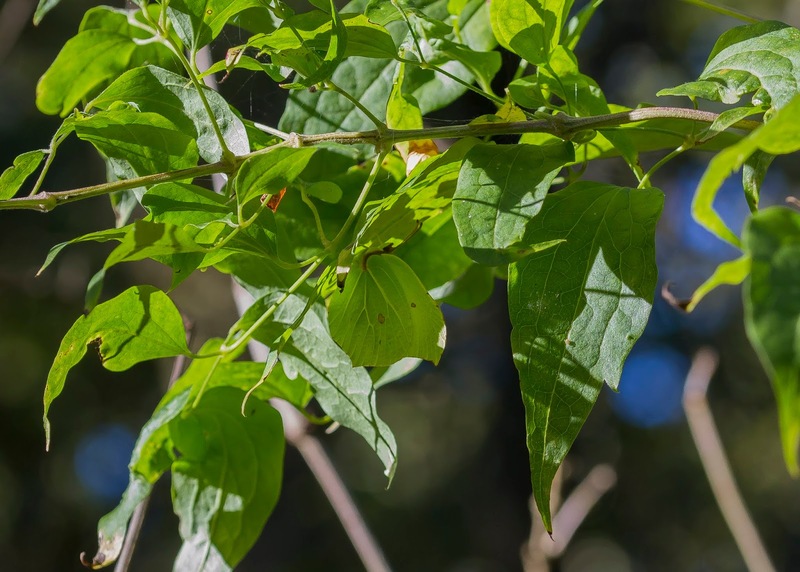 It could have been a very different story though as some parts of the country were reporting the drying up of larval foodplants in the drought which luckily we seemed to avoid. I did notice a lot of the Nettles were wilting in the mid summer heat so lets hope the species that use them could find suitable ones to lay eggs on. As for recording it was another good year too with several UKBMS transects being walked regularly and also a great coverage of WCBS squares. Casual recording was good with a lot of records emailed to me directly and also added to iRecord. It should also be noted that at the time of writing this I haven't received the results from the Garden Butterfly Survey or Migrant Watch yet so some of the below species details may see a slight increase when I do. 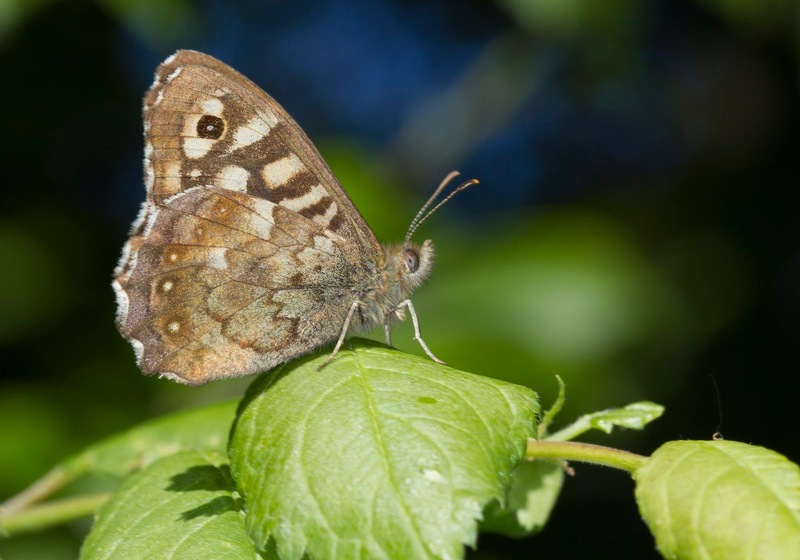 So far we've received just over 17,090 records amounting to 87,518 individual butterflies but once the final surveys have been repatriated to the county recorders this figure should also go up slightly. 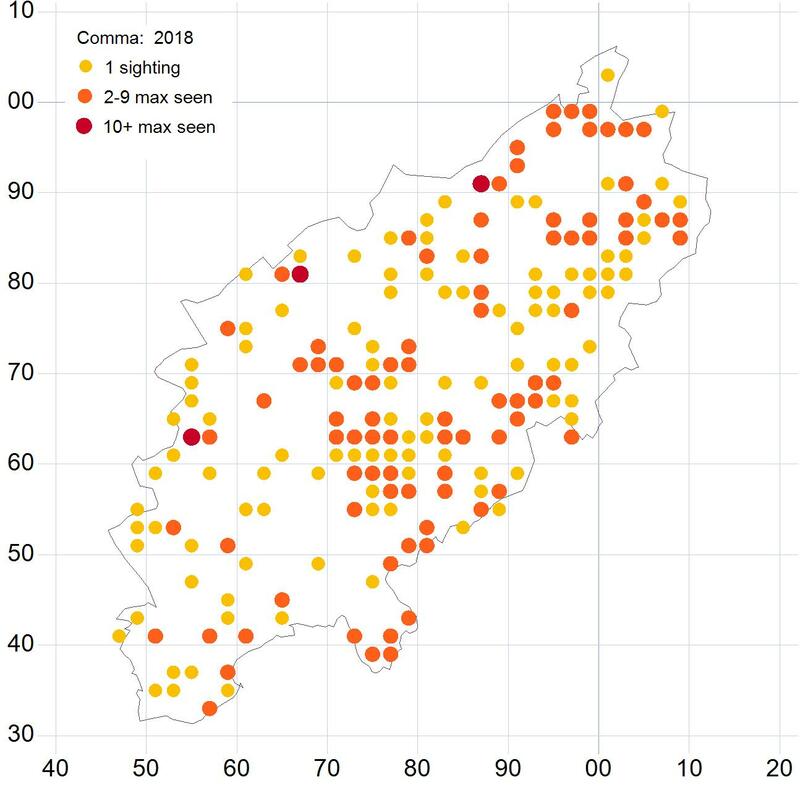 It really is encouraging so see so many people taking the time to record the butterflies they're seeing as this data really helps in our understanding of the population trends over the years. A big thank you also has to go to the small army of volunteers who help out at our conservation work parties during the winter months and this year more dates have been added with Woodland Wings and the Back from the Brink Project also holding work parties too.If you'd like to help give a bit back you can find details of the winter work parties on the events page of the Beds and Northants Butterfly Conservation website (www.bedsnorthants-butterflies.org.uk/events) and also in the branch newsletter. 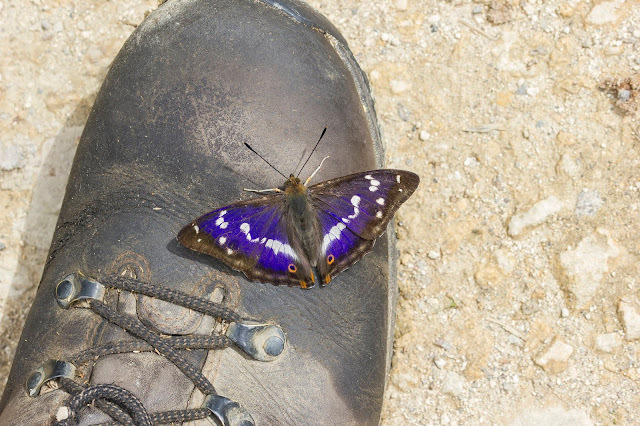 Not only are these conservation days important for the ongoing health of our butterflies there is also nothing better than walking around a site during the butterfly season seeing butterflies utilising an area you helped clear the winter before and knowing you helped make a difference! 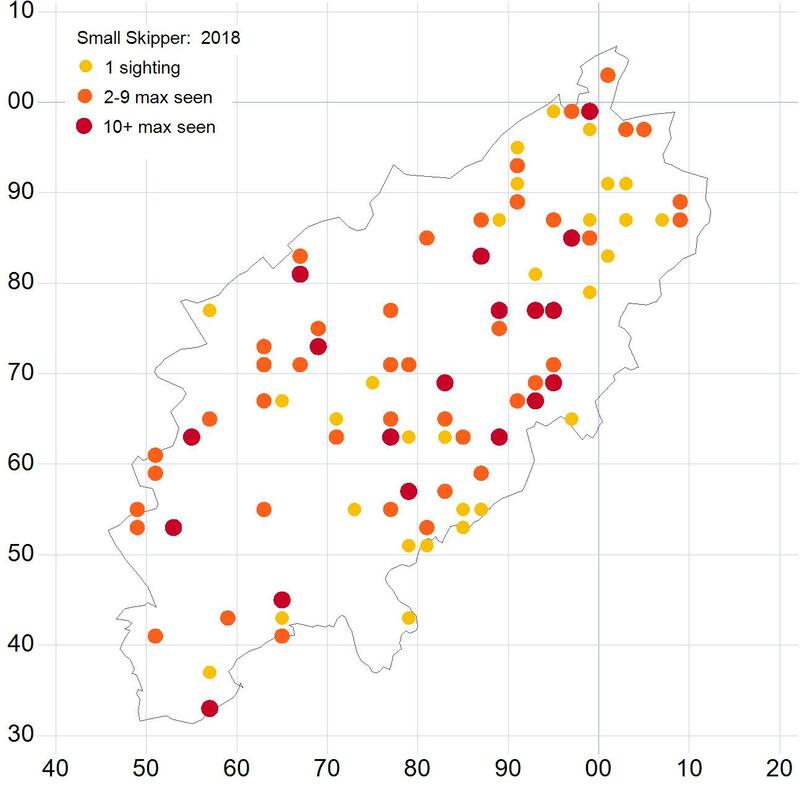 We also had a well attended series of summer walks last year in the county under the expert guidance of Doug Goddard with all target species spotted! If you'd like to join us on one of these walks this year to enjoy some of the species mentioned below they will be posted on the events page of the website and also in the spring edition of the newsletter. I cannot complete a summary of 2018 without briefly mentioning the superb work by the Back from the Brink Project in the attempted reintroduction of the Chequered Skipper back into the Rockingham Forest area. 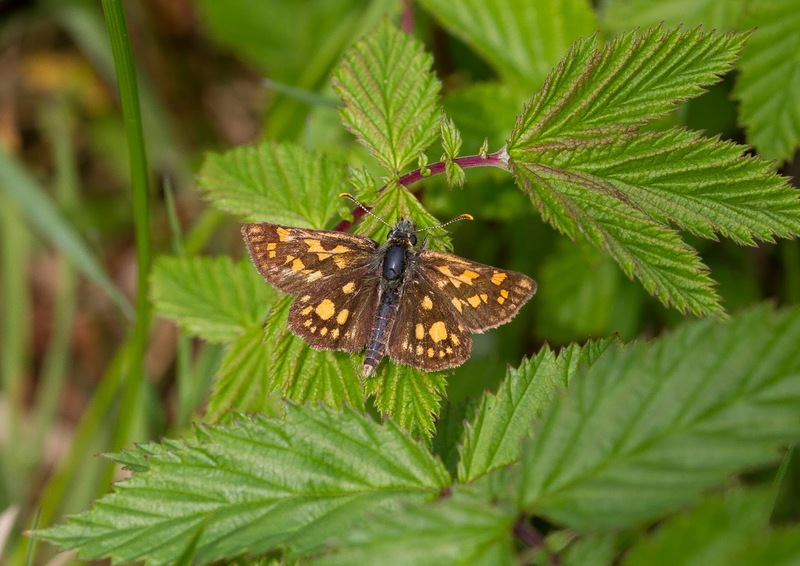 On the 24th of May 42 Chequered Skippers were released into a Rockingham Forest woodland with great media coverage and even an appearance on Springwatch. The decision was made to keep this initial release location quiet in order to give the butterflies the best chance of success in establishing themselves and also to allow for detailed monitoring of their behaviour without disturbance. Keep an eye on the Back from the Brink website for news about how the various projects are going and also for dates of work parties if you'd like to help by volunteering. The Small Skipper was 10% down from 2017 but the Essex Skipper was down by 79%. I think this is more to do with the fact that they were almost impossible to confidently record in the heat as they shot around the meadows like missiles and 2017 was a very good year for both species. Either way both species showed an increase when compared with a 10 year average with the Small Skipper up 74% and the Essex Skipper up 27%. 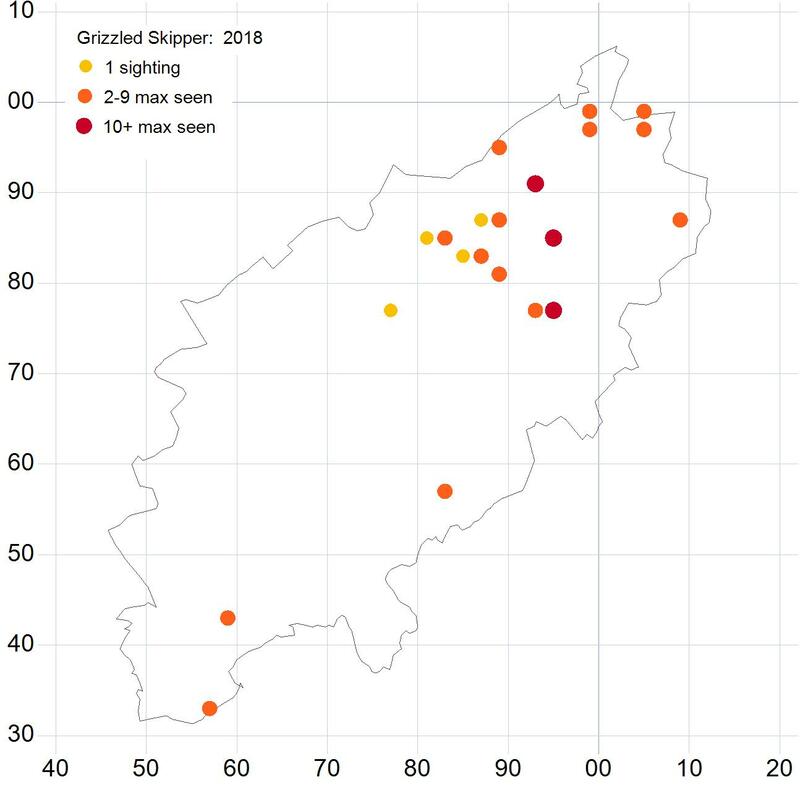 The Large Skipper had a better showing than it did in 2017 with a 16% increase. 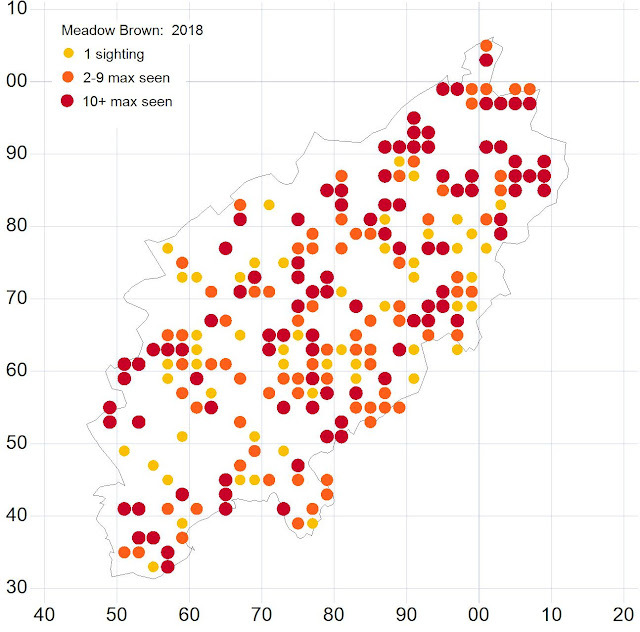 These species could be encountered just about anywhere where suitable grassland was present with the biggest counts coming from places such as the Nene Wetlands, Bradlaugh Fields, Fermyn Woods, Twywell Hills and Dales etc. 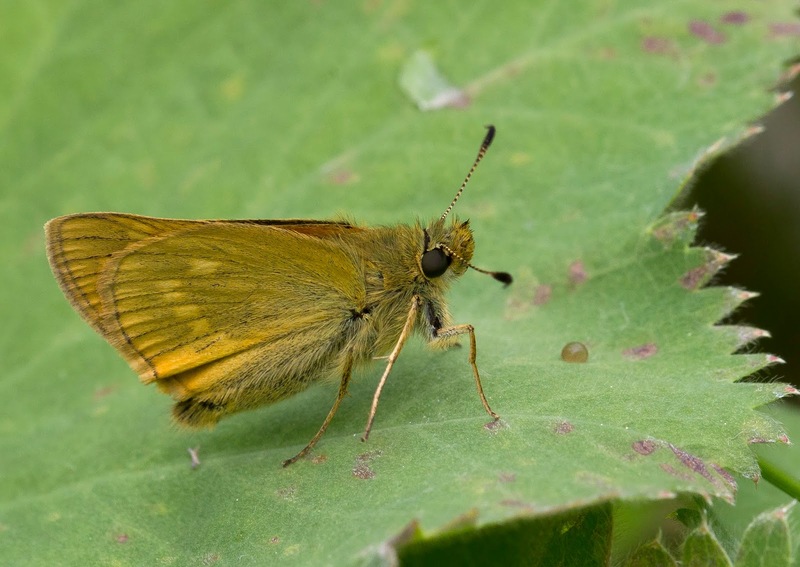 The first Small Skipper of the year was seen on the 7th of June at the Nene Wetlands and the last one was seen on the 4th of August at a site near Rushden. 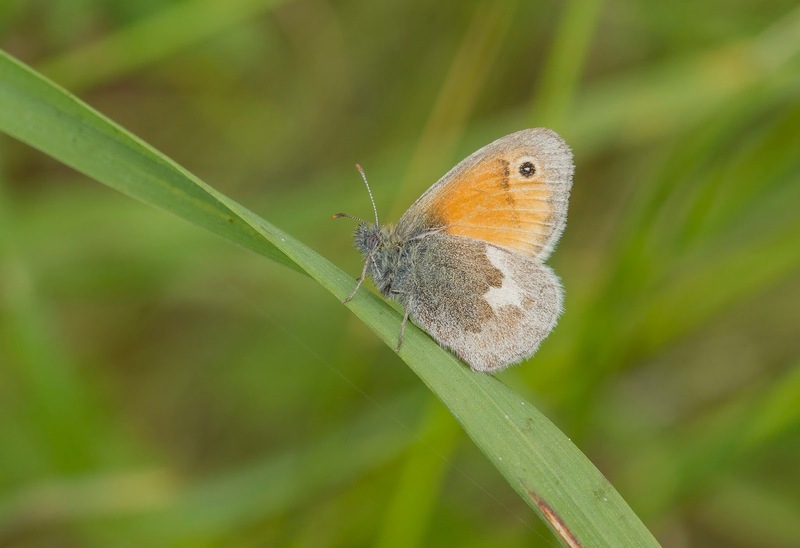 The first Essex Skipper was seen on the 10th of June at the Nene Wetlands and the last one was recorded at Hollowell Reservoir on the 11th of August. 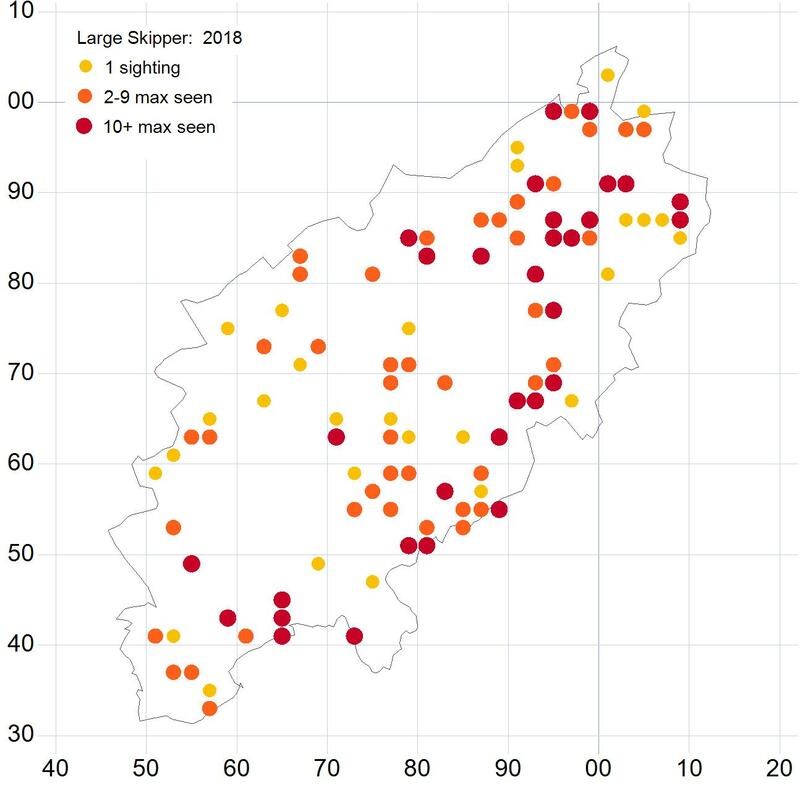 The first Large Skipper was recorded on the 26th of May on the New Duston Estate in Northampton and the last was seen on the 8th of August in Salcey Forest. 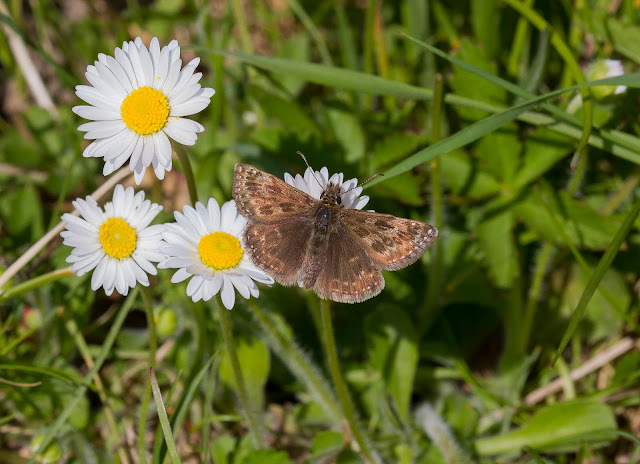 The Dingy Skipper had a good year in the county with a 52% increase from 2017 and a 148% increase over a 10 year average. 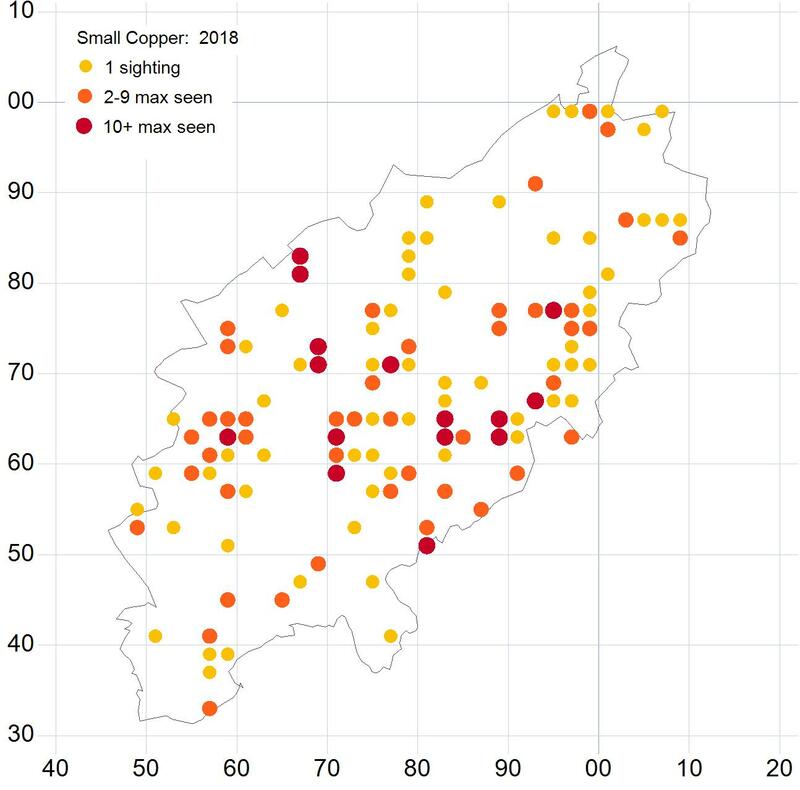 The species remains fairly localised and with the exception of a small colony in the south of the county at Croughton Quarry all the other known populations are in the north. The best sites to see this species were Fermyn Country Park, Old Sulehey Quarry, Twywell Hills and Dales and Polebrook Airfield. The first one was seen on the 7th of May at Twywell Hills and Dales and the last one was seen on the 21st of June also at Twywell Hills and Dales. 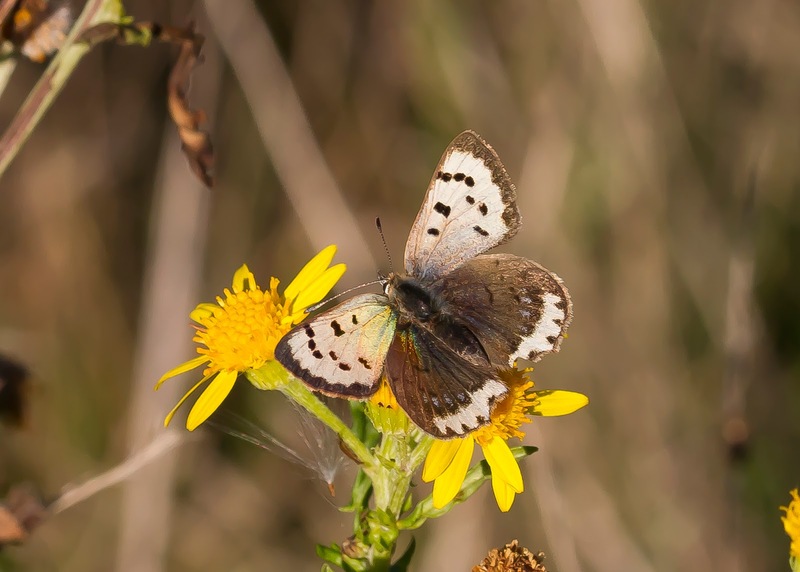 The Grizzled Skipper was up by 83% from 2017 and 148% from a 10 year average. 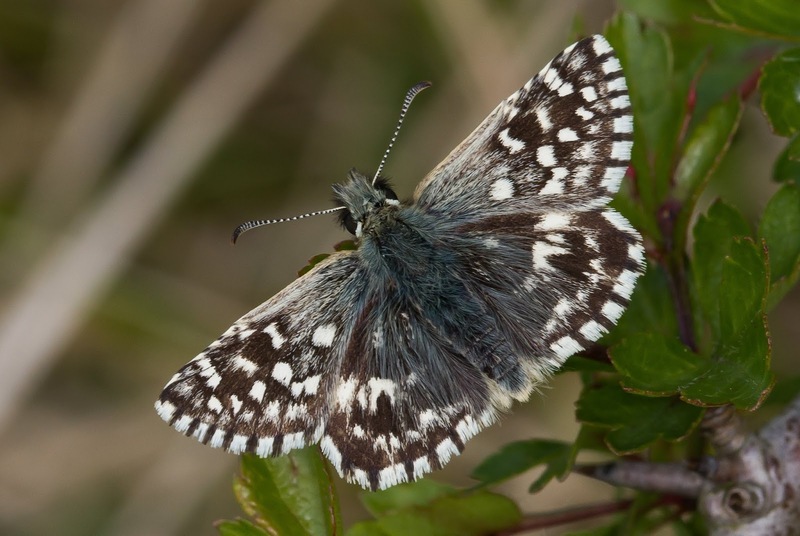 The Grizzled Skipper season was also notable for the discovery of a 2nd brood individual at Twywell Hills and Dales which is a rare occurrence in the county and only recorded on a few occasions before. Like the Dingy Skipper this species is localised in it's distribution with southern populations restricted to Croughton Quarry, Helmdon Railway Cutting and Yardley Chase while the other are in the north of the county with Twywell Hills and Dales and Fermyn Country Park giving the highest counts. The first Grizzled Skipper was seen on the 3rd of May at Twywell Hills and Dales and the last one, which was of course the 2nd brood, was recorded on the 21st of August also at Twywell Hills and Dales. 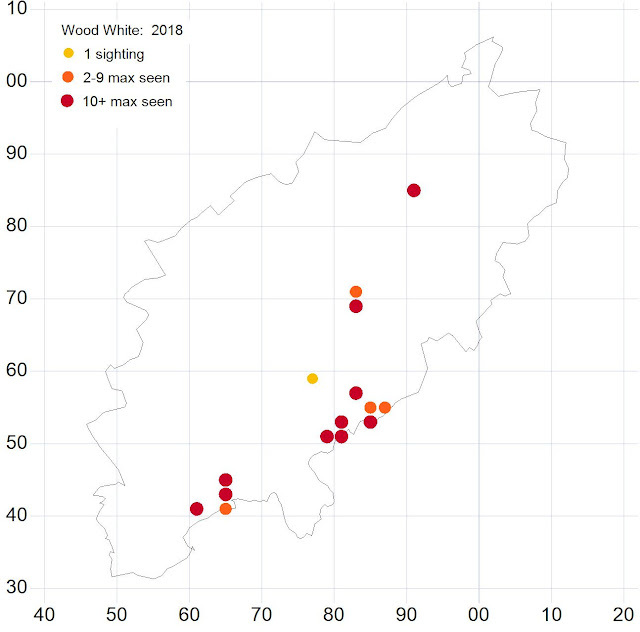 The Wood White was slightly down on 2017 by 13% but was still 44% up from the 10 year average. The strongholds still remain to be the woodlands along the Yardley Whittlewood ridge with Bucknell Wood and Salcey Forest being the best sites to see them although they can also be found in Hazelborough Forest and Wicken Wood. 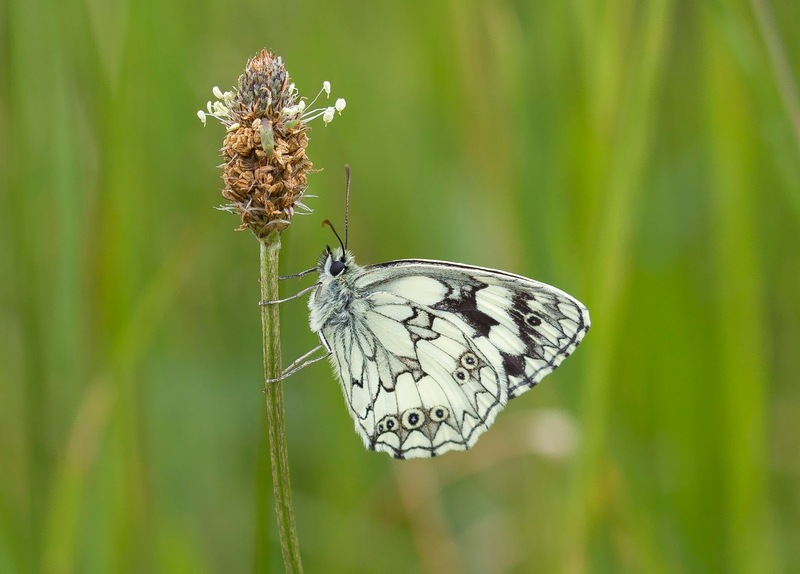 The species is also present in Yardley Chase and Sywell Wood and a colony was rediscovered during 2018 in Geddington Chase but please note all three of these sites are strictly private. 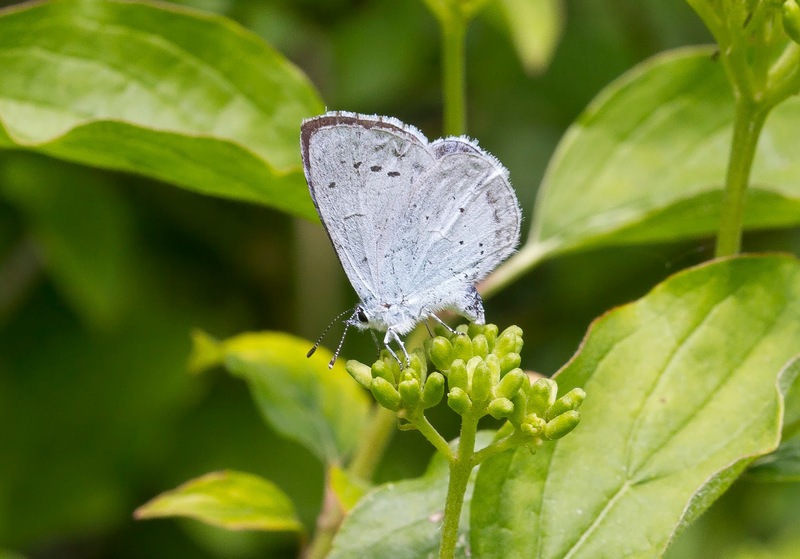 A project by Butterfly Conservation has been set up to help the Wood White and the Black Hairstreak in the Yardley Whittlewood region and is already well under way. This fantastic project, called Woodland Wings, is working with the Forestry Commission to help protect and provide the habitats these species need. There are events and work parties throughout the year to help support the project and details of these can be found on the events page of the Beds and Northants Butterfly Conservation local branch website (www.bedsnorthants-butterflies.org.uk/events). Salcey Forest was also honoured in 2018 when Julie Williams (CEO of Butterfly Conservation) and Sandra Muldoon (Head of Fundraising for Butterfly Conservation) paid a visit to see Wood Whites and Black Hairstreaks! Doug Goddard, Sharon Hearle and I had great pleasure showing them round and luckily the butterflies put on a good show for our visitors too. 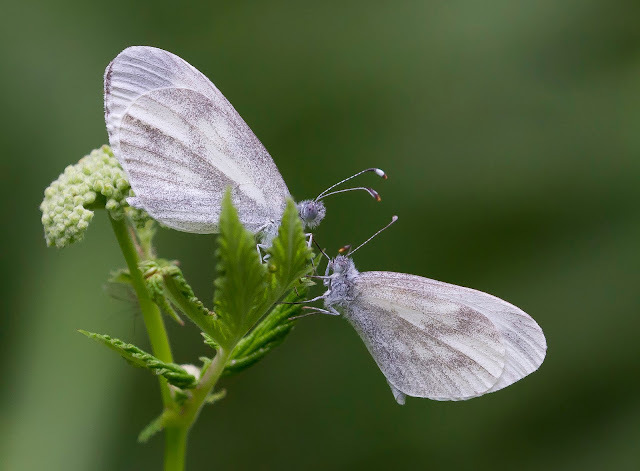 The first Wood White of the year was seen on the 14th of May in Bucknell Wood and the last of the 2nd broods were seen on the 4th of August in Hazelborough Forest. Dave James (me), Julie Williams (CEO of Butterfly Conservation), Sandra Muldoon (Head of Fundraising for Butterfly Conservation), Sharon Hearle (East of England Officer for Butterfly Conservation), and Doug Goddard (former county recorder and current Chairman of the Beds and Northants Butterfly Conservation local Branch) in Salcey Forest. 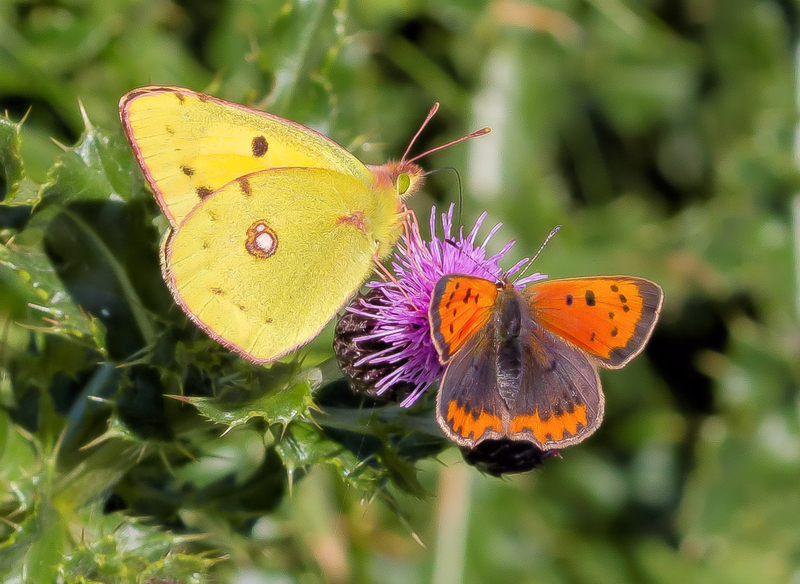 The Clouded Yellow had a superb end to it's season in the county after a steady trickle of sightings during the spring and summer culminated with evidence of breeding at three locations and also a good display of the colour form helice too. As Clouded Yellows are migrants some years they're abundant while in other years where there are very few and the records show a 800% increase from the decade average showing that despite a slow start it's year ended on a high. 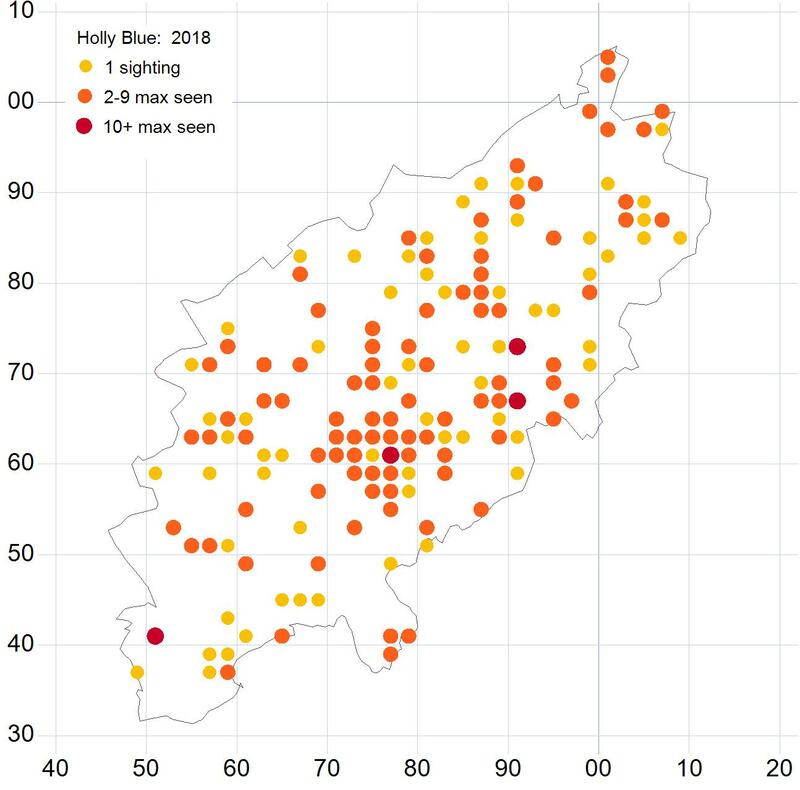 The one was recorded in Bucknell Wood on the 6th of June and then they started to appear in single figures around the county at Ravensthorpe and Hollowell Reservoirs, Pitsford Reservoir, Brackmills Wood, Salcey Forest, Fermyn Country Park, Stortons Pits and Old Sulehey etc. Then as autumn approached Salcey Forest and Old Sulehey suddenly produced small concentrated populations showing evidence of successful breeding while Sywell Country Park produced a peak count of 24 on the 1st of October (the 2nd highest count we have on record), several mating pairs were observed and also several different form helice were recorded too. The form helice were also recorded at Hollowell and Salcey Forest too. 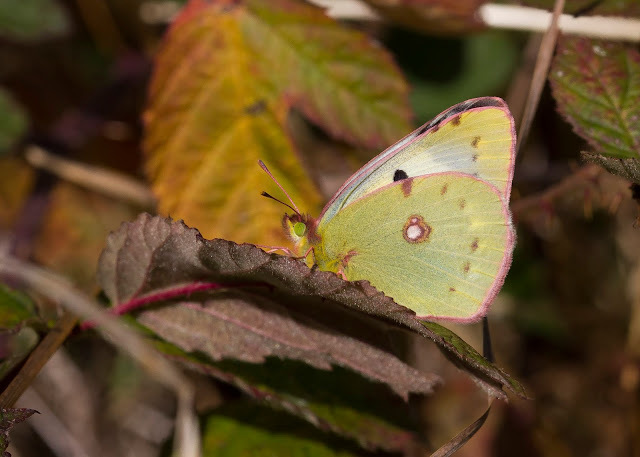 The last Clouded Yellows of the year were seen at Sywell Country Park on the 22nd of October. 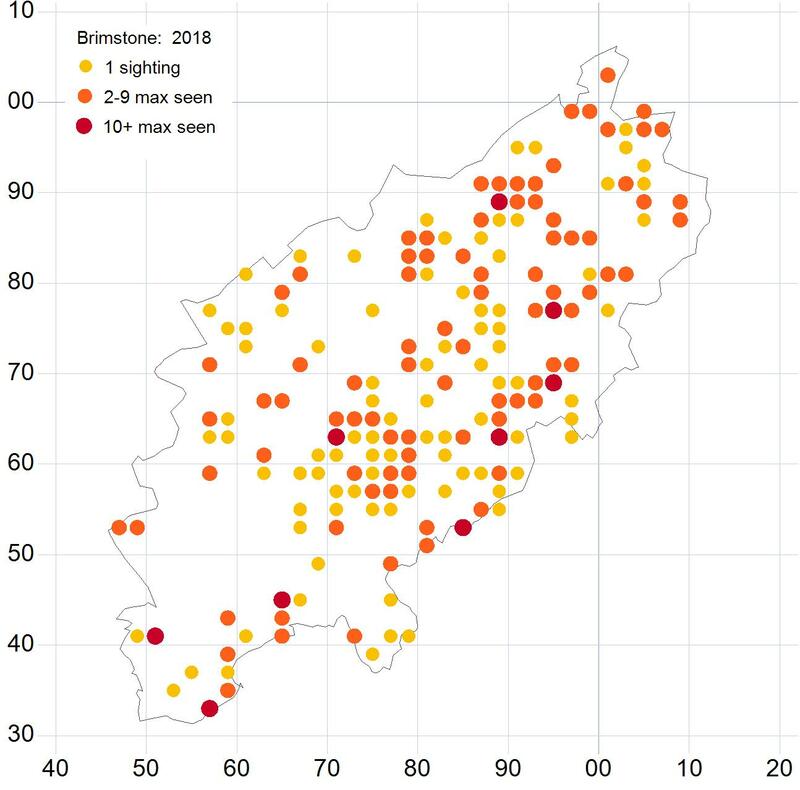 Although the Brimstone was 160% up from the 10 year average the numbers were only just higher than they were in 2017. The species can be encountered anywhere and is often the first butterfly seen during sunny days in the winter and early spring. The first one was seen on the 25th of January in Fineshade Wood and the last of the year was seen on the 13th of November at Pitsford Reservoir. The Brimstone and it's amazing camouflage! The commoner Whites had a fairly poor showing in 2017 so it was good to see them all flying in big numbers once again in 2018. 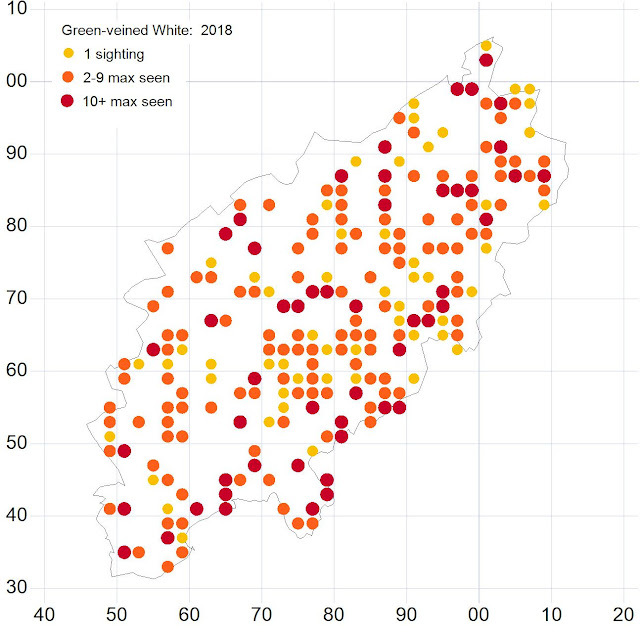 The Large White was up 152% from 2017, the Small White was up 278% and the Green-veined White was up by 171%. All three are well above their 10 year averages with the Small White up by nearly 800%. 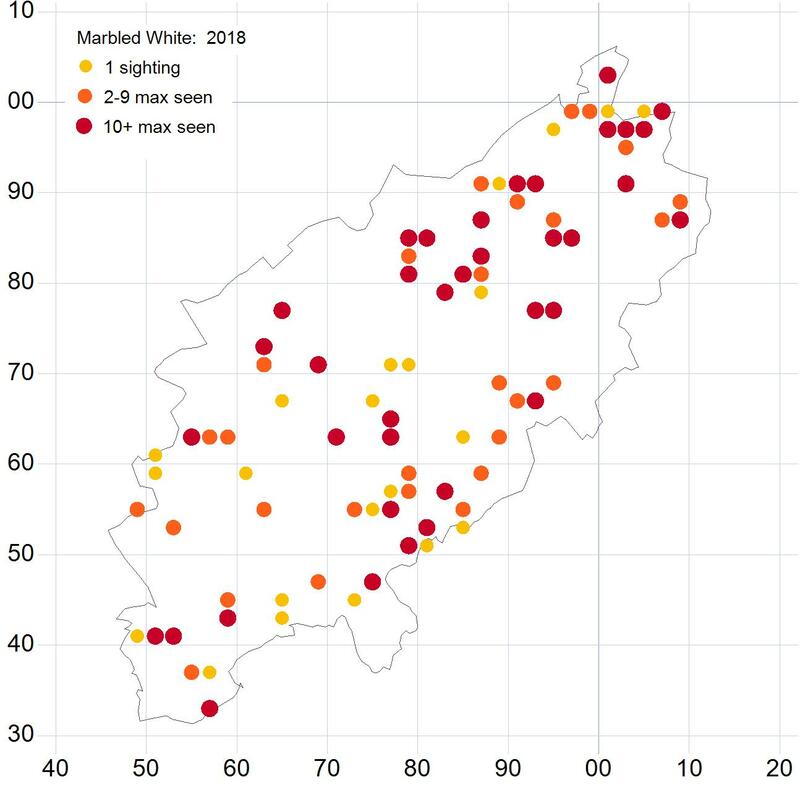 The first Large White was seen on the 16th of April in Long Buckby and the last on the 10th of October in Old village. The first Small White was recorded on the 16th of March in Barton Seagrave and the last one was seen on the 22nd October at Sywell Country Park. 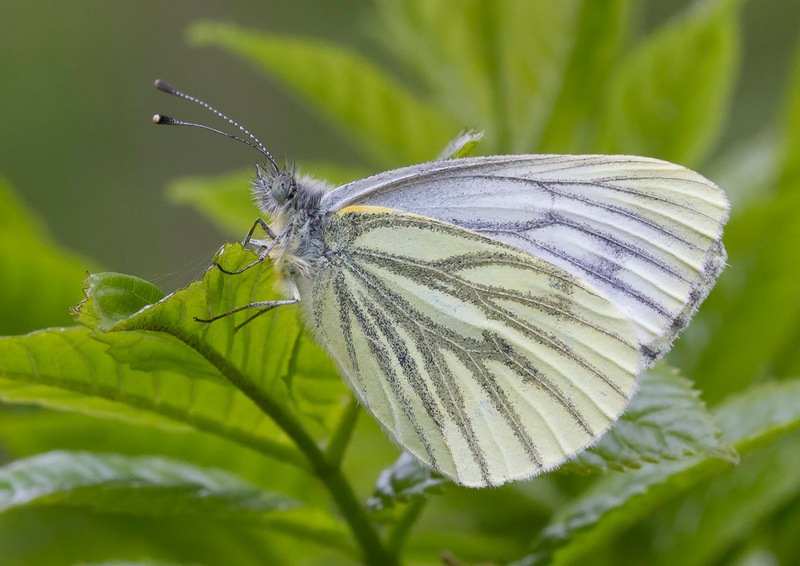 The first Green-veined White was seen on the 14th of April in Corby and the last one was seen on the 22nd of October at Farthinghoe Nature Reserve. 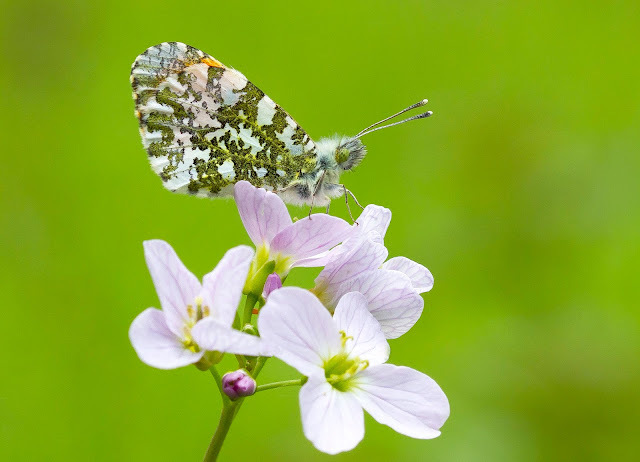 The Orange-tip was slightly up from 2017 and luckily seemed to dodge the unsettled weather at the start of the year. This is another species that can be found almost anywhere where it's larval plants grow (Garlic Mustard and Cuckoo Flower) but the highest counts came from the Nene Wetlands, Barnwell Country Park, Bucknell Wood, West Lodge Rural Centre near Desborough, Titchmarsh Nature Reserve, Twywell Hills and Dales and stretches of canal near Braunston and Hunsbury. The first ones were seen on the 14th of April at Little Harrowden and Thrapston Gravel Pits and the last one was recorded on the 1st of July in Daventry. 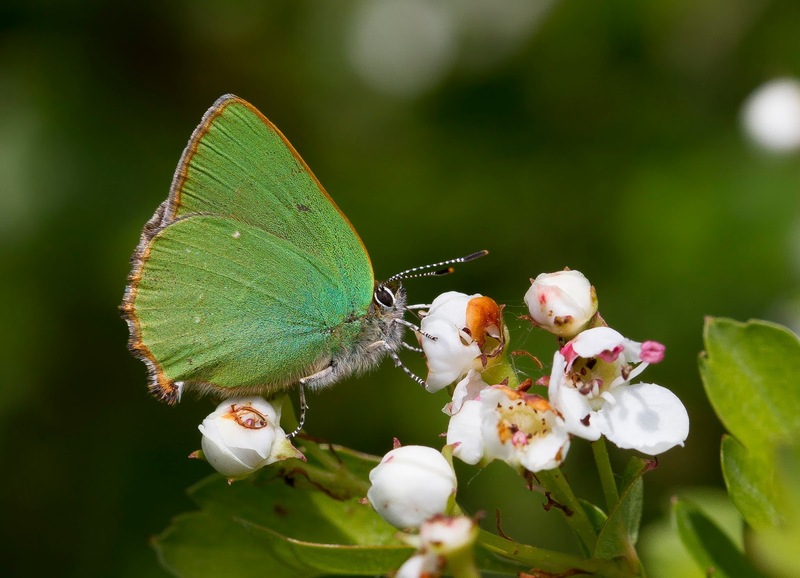 The Green Hairstreak was slightly down from 2017 and show a 16% decrease although that's still 18% above the 10 year average. 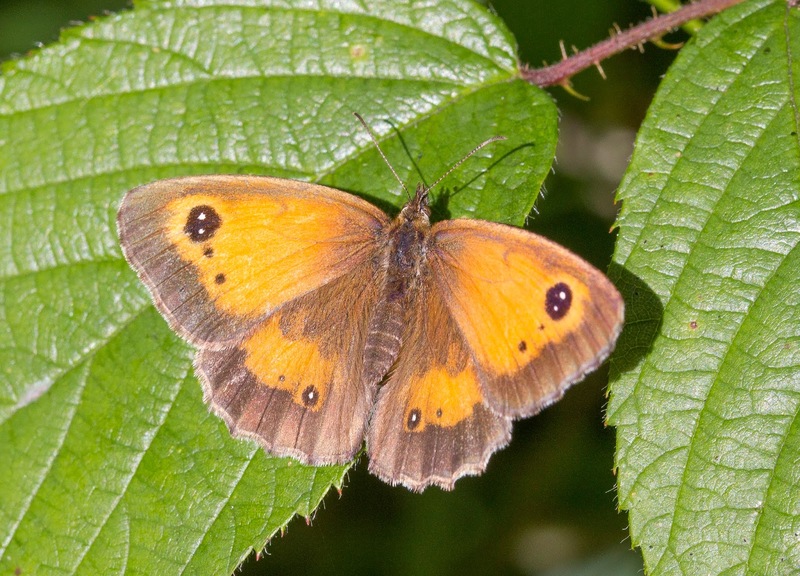 This is a very localised butterfly in the county and is restricted to a few sites in the north of the county. The best places to see them in 2018 were Fermyn Country Park and Twywell Hills and Dales which had the biggest numbers but they were also seen at Collyweston Quarry, Priors Hall, Weekley Hall Wood, West Lodge Corner Plantation, Old Sulehey etc. The first Green Hairsteak of the year was seen on the 1st of May at Twywell Hills and Dales and the last on the 11th of June at Fermyn Country Park. The Purple Hairstreak had an exceptional year with the species being recorded in many locations and also in some big numbers. They were 299% up from 2017 and 809% up from the decade average. It wasn't just the large numbers that made the year amazing but also the amount of groundings observed as this normally elusive insect descended from the canopy and onto low lying vegetation or the ground. In fact on two occasions in 2018 while out recording I had to watch where I put my feet in case I didn't tread on any. This video below was taken in Old Sulehey and every speck you can see flying about is a Purple Hairstreak with 40 being recorded on this Bracken alone! The Purple Hairstreak was recorded in a lot of localities around the county with one lucky observer even finding one on their Kettering town centre fence! 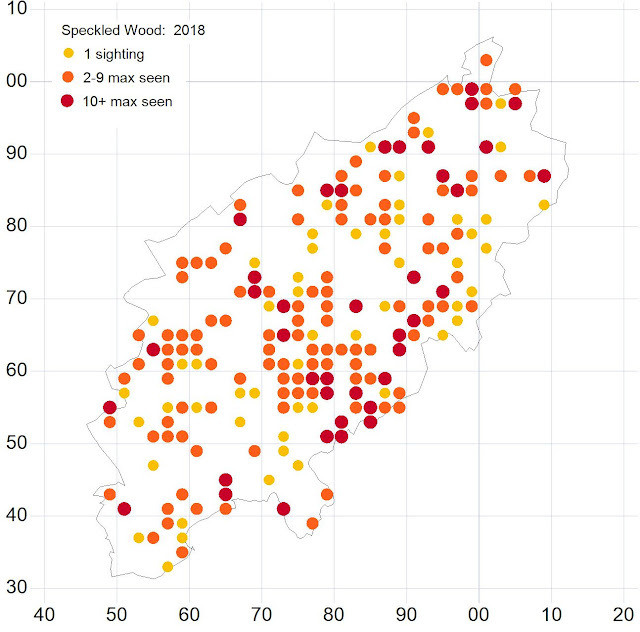 Of course the highest numbers came from our woodlands with the best sites being Whistley Wood, Fermyn and Lady Woods, Salcey Forest, Bucknell Wood, Brampton Wood, Southwick Wood, Hazelborough Forest and Old Sulehey. The first ones of the year were recorded on the 22nd of June in Fermyn Wood and Salcey Forest and the last were seen on the 11th of August at Sywell Country Park and Wicken Wood. 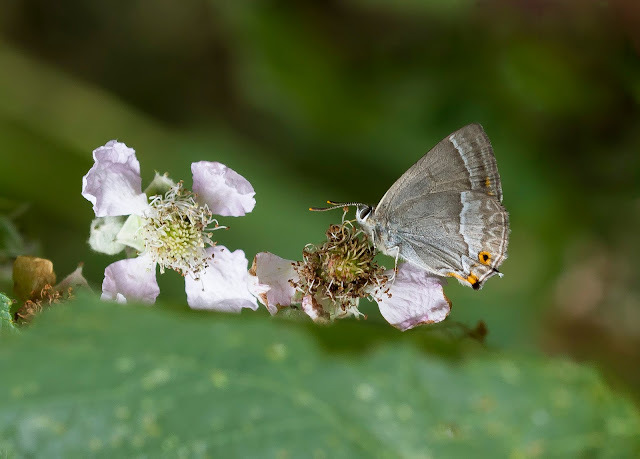 The White-letter Hairstreak season looked good from the start so a request was made for recorders to check all the local Elms and this proved productive in finding new colonies. 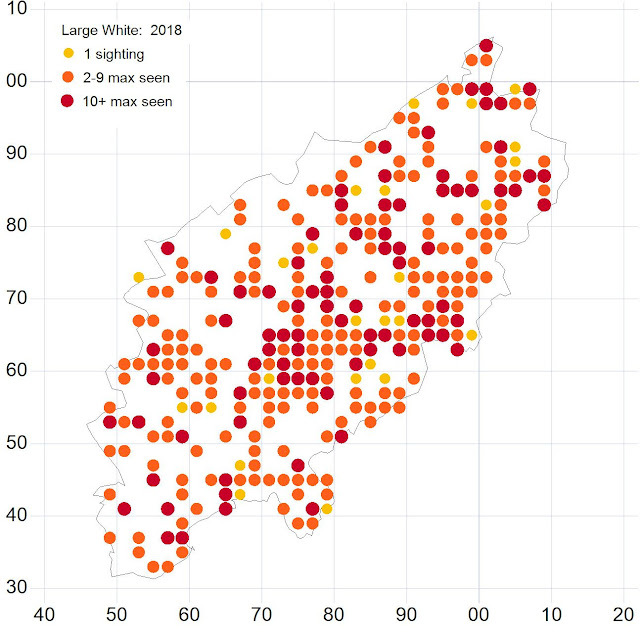 The species was 480% up from 2017 and 856% up from the 10 year average. The best sites to see them were Fermyn and Lady Woods, by the A5 at the Hillmorton Lane junction, Lyvedon New Bield, Hermitage Wood and Ashton Wold. The first ones of the year were seen on the 18th of June at Borough Hill in Daventry and along the path that runs through the middle of Brackmills Industrial Estate and the last one was observed on the 2nd of August in Yardley Chase. 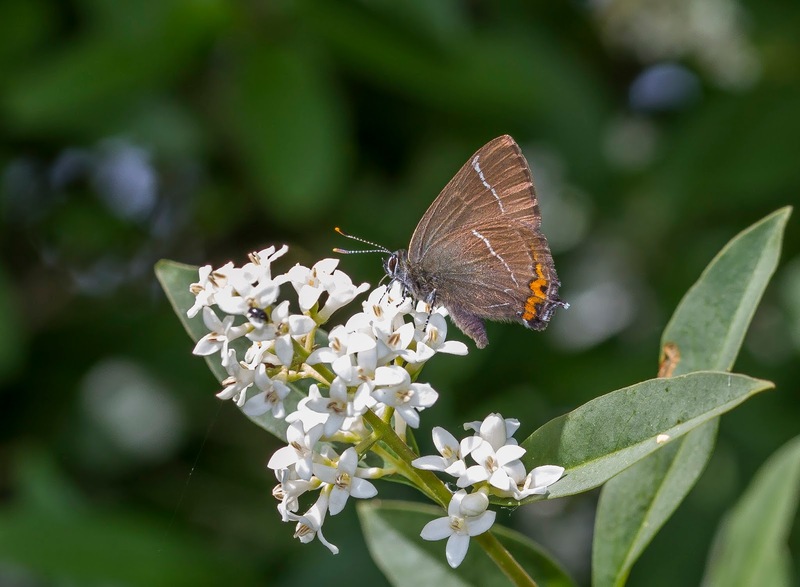 2018 be will talked about for many years to come for it's staggering Black Hairstreak season! Being lucky enough to witness it first hand will be something I don't think I'll be forgetting anyway. 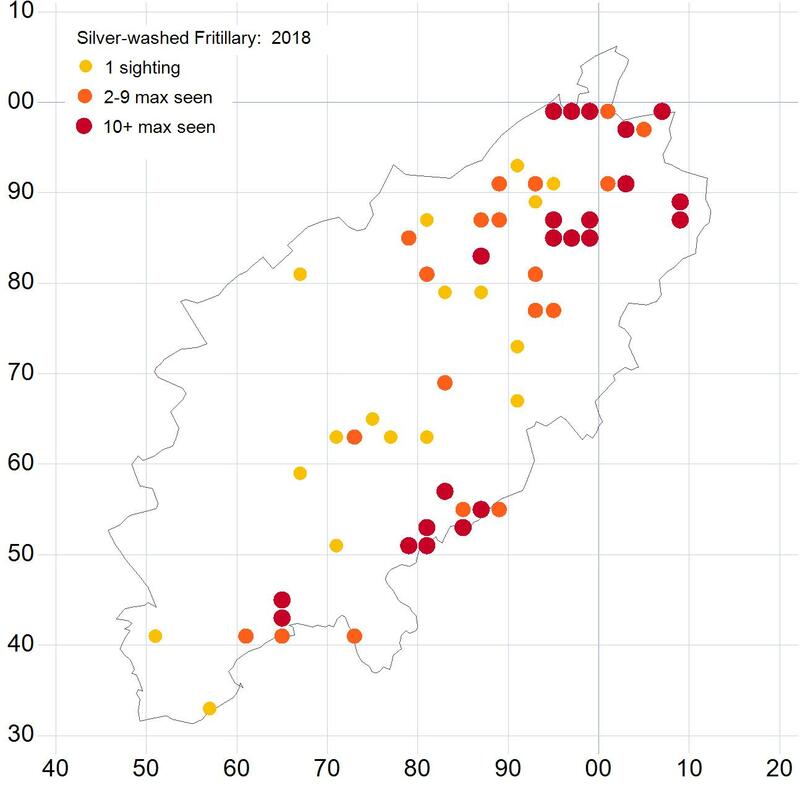 The chief strongholds of the species in the county had incredible numbers and it really was a sight to behold. 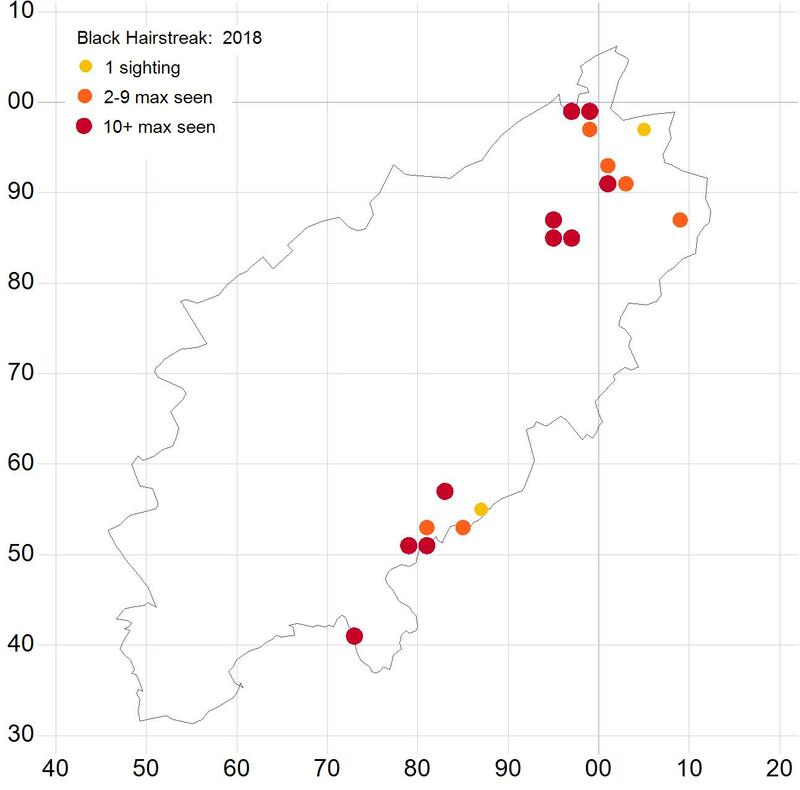 To try and put this into perspective more Black Hairsteaks were seen in a single day at Glapthorn Cow Pastures in 2018 than the whole of the county the previous year. They were up by 869% from 2017 and up by a very impressive 2250% above the 10 year average. 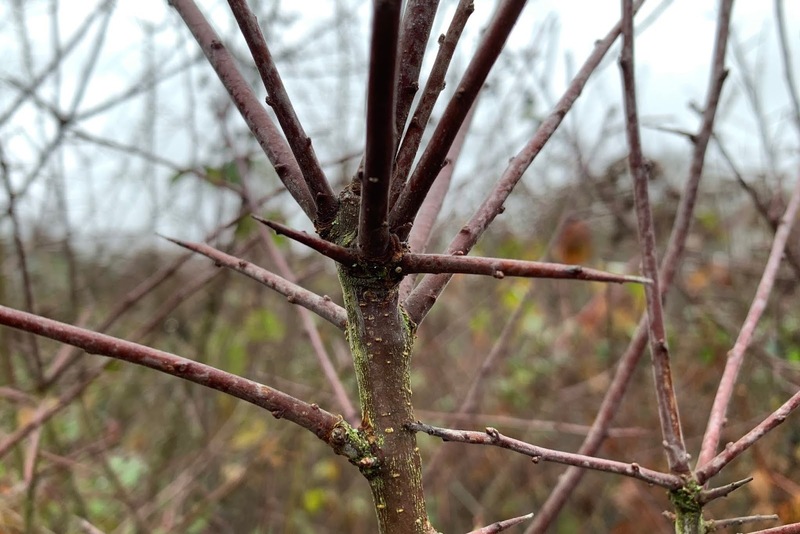 The best sites to see them were Glapthorn Cow Pastures, the Blackthorn thicket above Fermyn Country Park, Fineshade Wood and Salcey Forest and few new locations were found after recorders checked local Blackthorns away from the key sites. The first one was seen on the 3rd of June at Glapthorn Cow Pastures and the last on the 2nd of July in Salcey Forest. This incredible year for the species also allowed me to realise an ambition of finding one of the eggs in the wild. 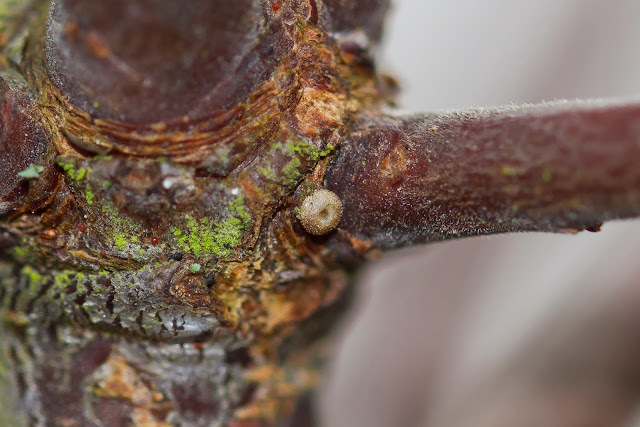 Black Hairstreak eggs are very hard to find and despite years of trying I've failed to locate one, until this year that is when spurred on by their recent abundance I managed to find one in Glapthorn Cow Pastures! 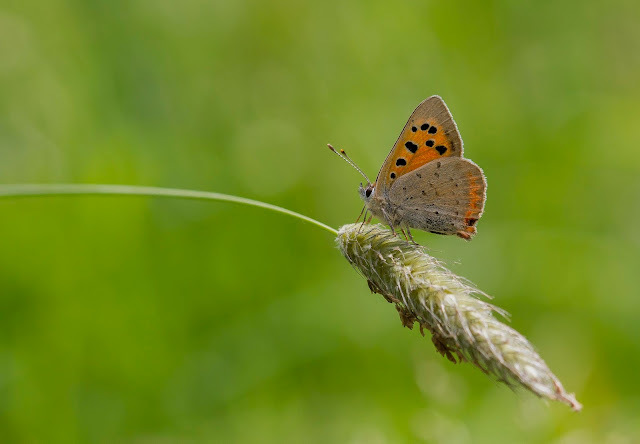 The Small Copper was another species that seemed to do extremely well in 2018 with good numbers in the Spring and Summer broods and a spectacular showing in Autumn. 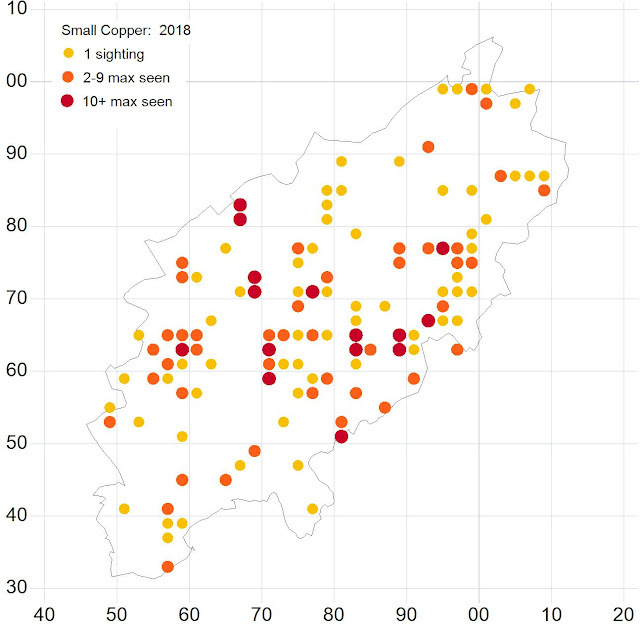 Records of Ragworts and Thistles covered in Small Coppers were not unusual during August, September and October and good numbers were seen at Summer Leys, Harlestone Firs, Hollowell Reservoir, Ravensthorpe Reservoir, Pitsford Reservoir, the Nene Wetlands and Sywell Country Park where they had to wrestle at the last site with the Clouded Yellows to get to the nectar! They were 264% up from 2017 and 757% up from the 10 year average. The first one was seen on the 6th of May at Borough Hill and the last on the 5th of November at Sywell Country Park. 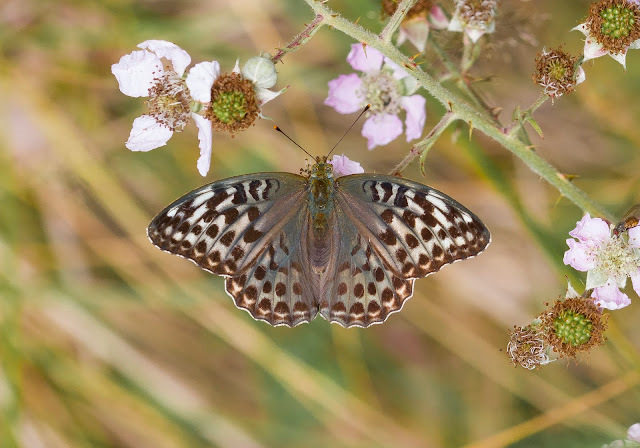 If I could pick just the one butterfly as a butterfly of the year it has to be the very rare aberration found by Doug Goddard. After a very excited phone call from him and a mad after work dash I managed to see it. It's called the Small Copper aberration schmidtii and this one also had the markings of an aberration caerleopunctata too. Unfortunately the following day it had vanished, perhaps it was predated or perhaps it just moved on but it's a real shame it disappeared so quickly. You can see a couple of photos of it below. 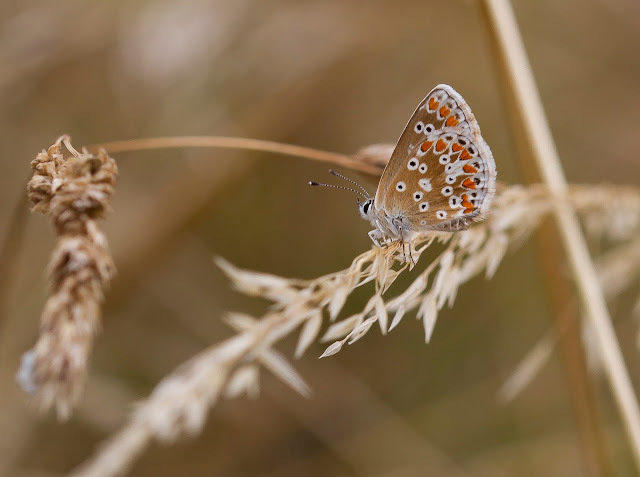 The Brown Argus also did well in 2018 with an increase of 319% from 2017 and a 430% increase over the decade average. 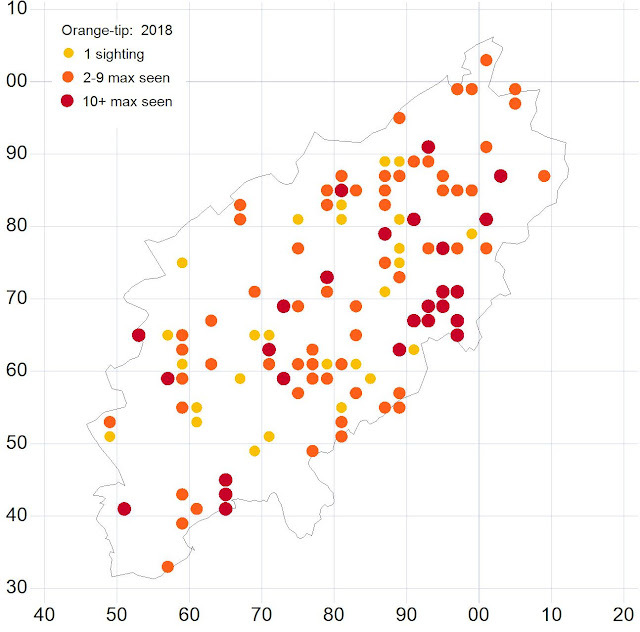 The highest counts came from Summer Leys, Harlestone Firs, Twywell Hills and Dales, Irchester Country Park, Salcey Forest, the Nene Wetlands and Great Morton Sale. The first was seen on the 17th of May at Twywell Hills and Dales and the last was seen on the 10th of October at Harlestone Firs. 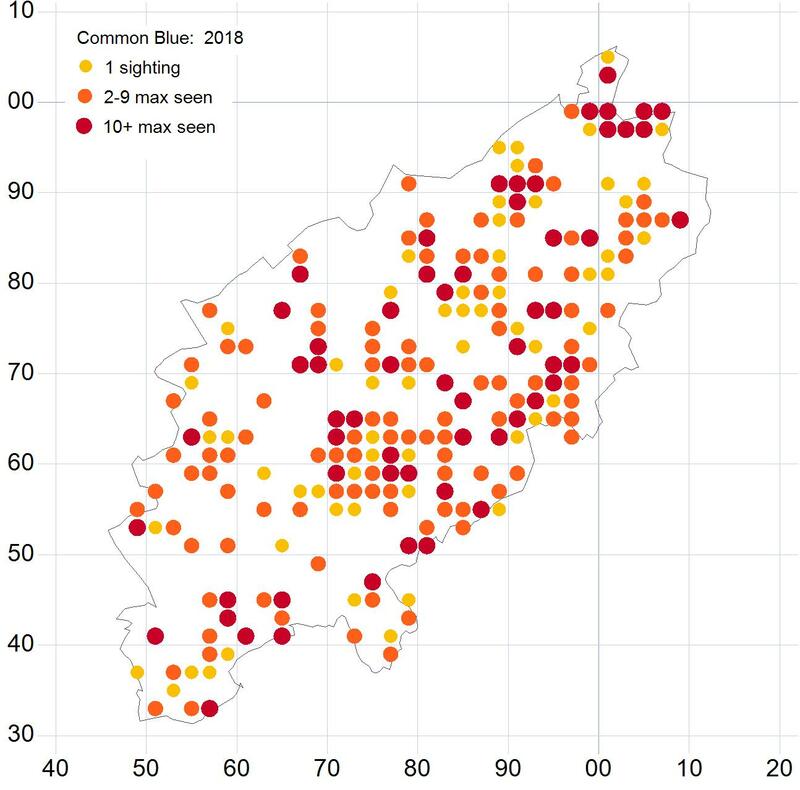 The Common Blue season was similar to the Brown Argus with a 255% increase from 2017 and a 406% increase from the 10 year average. Some incredible counts of up to 300 came from some sites during the latter part of the year. The best sites to see the species were Summer Leys, Old Sulehey Quarry, the Nene Wetlands, Ravensthorpe Reservoir, Polebrook Airfield, Twywell Hills and Dales, Helmdon Railway Cutting, Collyweston Quarry, Great Morton Sale and exceptionally high counts came from Welford Quarry, Priors Hall, Harlestone Firs, West Lodge Rural Centre near Desborough and Hollowell Reservoir dam. The first one of the year was seen on the 3rd of May in Wellingborough and the last was recorded on the 21st of October in Croughton Quarry. 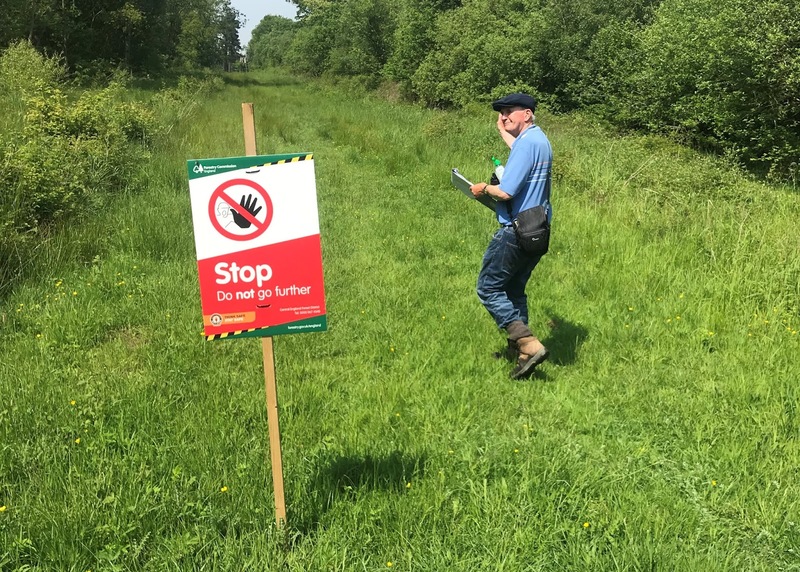 "Brian Laney had visited Spanhoe Airfield earlier in 2017 to collect various wild flower seed having heard that this site was going to be quarried sometime in November that year. 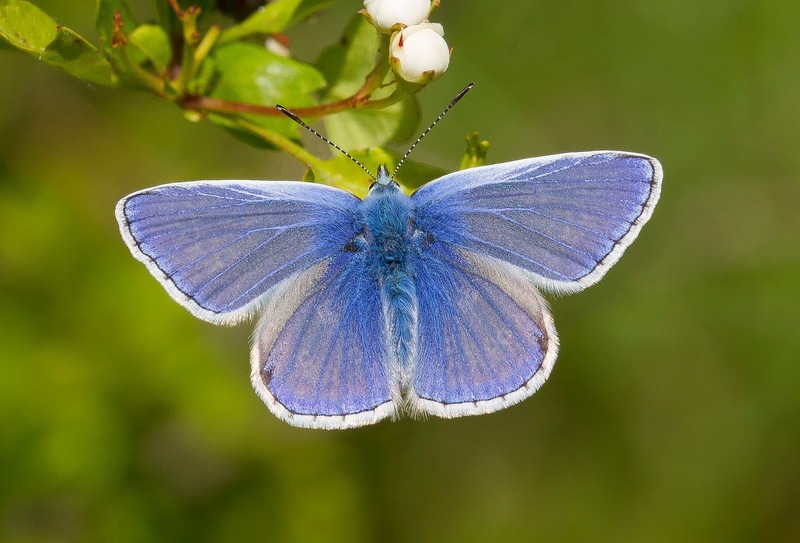 When at the site collecting seed he noticed that there was a healthy population of Chalkhill Blue (P coridon) flying and immediately became concerned that this species would also be eradicated as quarrying commenced. He contacted me to ask if I had bred coridon, or knew anyone else who had, with a view to releasing butterflies on a new site in Northamptonshire the following year. I was pleased to be able to tell him that I had previously bred this species of butterfly on many occasions. I was particularly keen to help because I felt that this population may have been isolated and as such could be genetically very interesting. 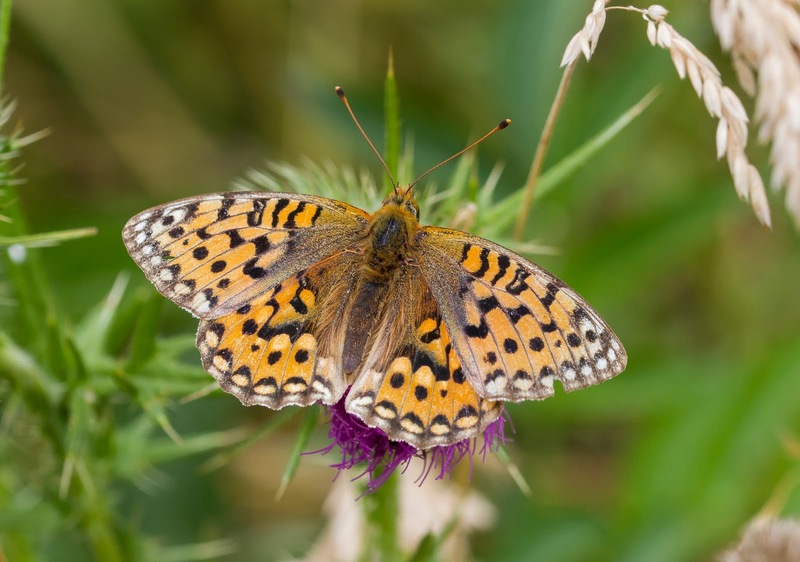 Brian sought permission from the landowners to collect adult butterflies and once granted we duly set off to Spanhoe on 25th August 2017. 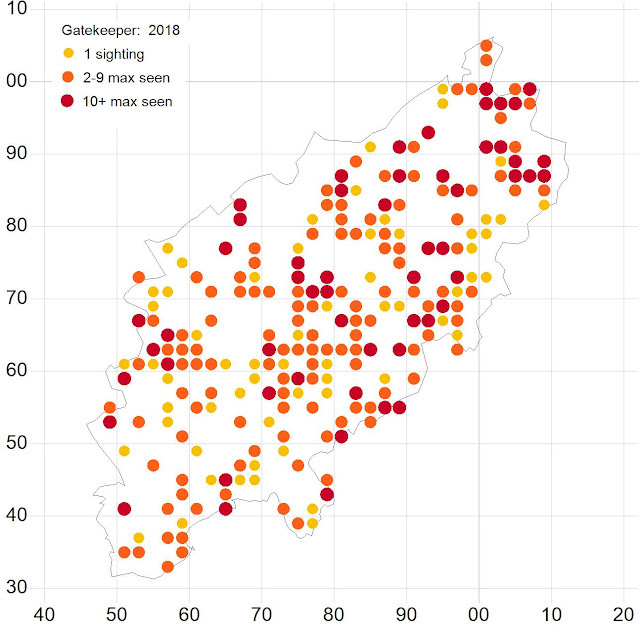 I was concerned that this was already late in the flight period of this species, and with 2017 having been such a hot summer there was a good chance that most of the adult butterflies would already have laid out or expired. Indeed when we got there, although numbers flying were still good, the majority of butterflies were well past their best. I managed to catch around 50 females in just over an hour and roughly selected the best 30 females for egg laying. When I got home later that day I gave the females a good feed on honey and water solution and placed half on growing food plant (also collected from Spanhoe) under black netting and placed half on cut foodplant in a plastic cylinder type breeding cage. The females were seen laying the following day, although several had expired already probably due to old age. In the autumn, the ova laid on the growing food plant were left outside for the duration of the winter and had to face the “beast from the east” early in 2018. To increase the chances of overall success, a different approach was taken with the ova on the stems of cut food plant which were removed from the cylinder cage and placed in a shallow cylinder with netting top and bottom and the whole was pinned to a south facing fence and left open to the elements of the winter. A significant number of ova had also been laid on the side of the cylinder and on the net top. These ova were painstakingly removed, one by one and placed inside the double netted shallow cylinder. This double netting design was used to ensure good drainage and free passage of air to minimise the risk of mould and mildew. This technique is also very effective in excluding predators such as earwigs, snails and birds etc. After the extreme cold weather had passed the shallow cylinder was placed inside a larger sealed plastic box (to prevent desiccation of the ova) and the whole was placed inside a refrigerator which was kept between 2 and 7 degrees C. This precaution was taken because of the unreliability of the ambient weather at the time. By keeping the ova cold until the spring had properly settled it was felt that the survival rate of the small larvae might be higher. Both setups produced several hundred larvae, and these then developed at more or less the same rate as would be expected in the wild. 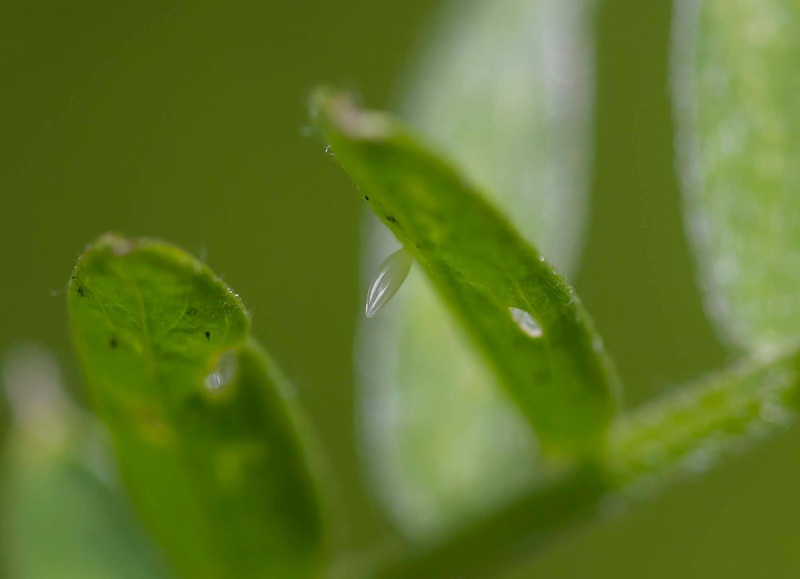 It was very important that the development of the larvae and pupae, and ultimately the emergence of the butterflies was in synchronisation with the wild populations to ensure that the conditions would be optimum for egg laying after release. The first adult to emerge was a male on 4th July. Several more males emerged over the next days before the first female emerged on 11th July. This female was paired before the wings had even fully expanded. It is normal that males start emerging before the first females and as females emerge males often assemble to copulate with the females before they have taken their maiden flight. All the adult butterflies were transferred at night to the original netted pot with growing food plant for pairing. It was felt that the best success would be achieved if paired females were released rather than releasing males and females at the new site and hoping for pairings afterwards. Likewise it was felt that putting down pupae at the new site would in all likelihood be less successful than releasing paired females. 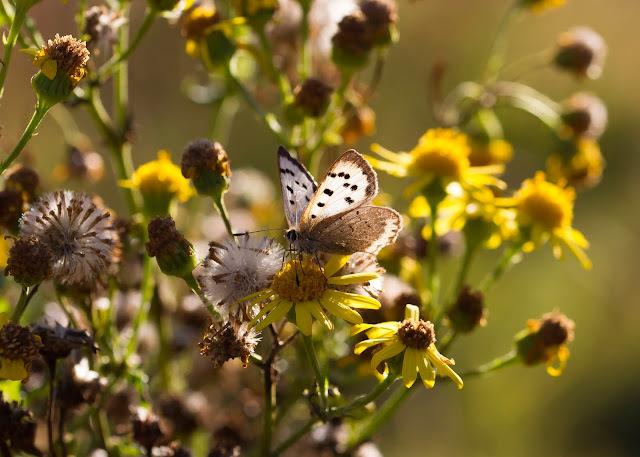 Unfortunately by the time a new release site had been identified and permission to release had been gained, some of the adult butterflies had expired. 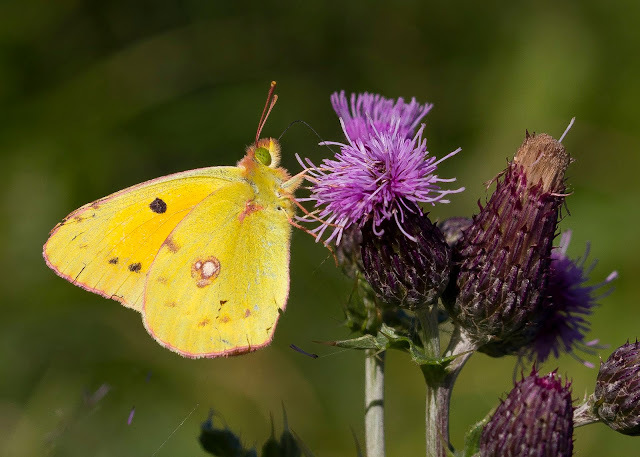 The new site chosen for release was Southorpe Rough and permission was granted for release on 5th August, almost 1 month after the first adult butterflies had started to emerge. During this period 53 females and 58 males had emerged, and on the 5th August, after feeding the butterflies on water and honey solution, 25 females and 18 males were released. This number included two females still in copulation. No ovipositing was witnessed at the site on the day of release, but this was not particularly surprising." The Holly Blue had a good year with a good spread of records around the county. They were 343% up from 2017 and 507% up from their 10 year average. Although they were observed all over the county the best sites were Abington Park, Farthinghoe Nature Reserve, Castle Fields in Wellingborough and Finedon Pocket Park. The first ones were seen on the 18th of April in gardens in Northampton and Kettering and the last one was recorded on the 25th of September at Sywell Country Park. 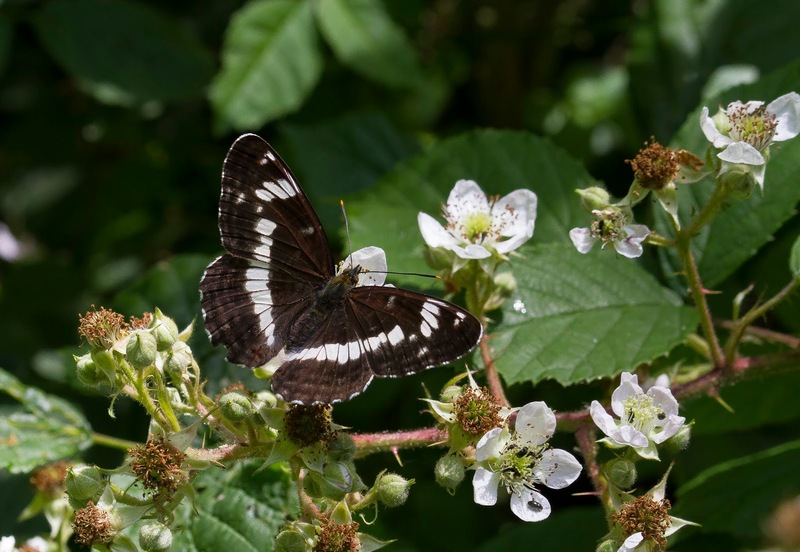 Like the previous year 2018 proved to be a good season for the White Admiral and they could be seen flying in good numbers in our woodlands with Bucknell Wood, Salcey Forest, Hazelborough Forest and Fermyn and Lady Woods being the chief strongholds. They were 57% up from 2017 and 230% up from the 10 year average. 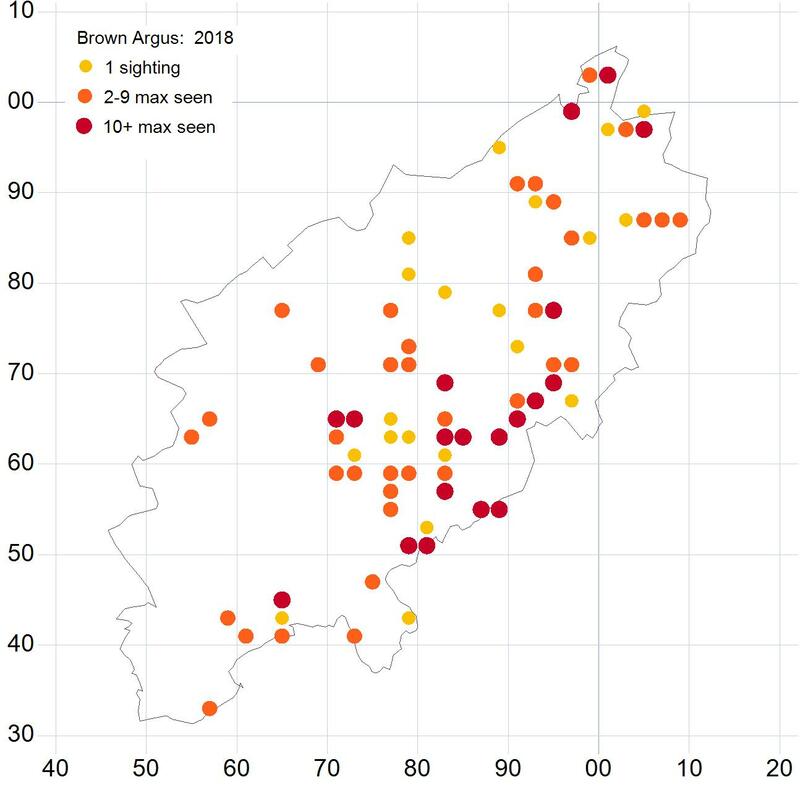 The first ones were seen on the 18th of June in Fermyn Wood and Bucknell Wood and the last one was recorded on the 2nd of August in Yardley Chase. The Purple Emperor did well in 2018 and the species has increased it's range once again. Sightings came in from all over the county with some amazing records too such as the man who found one on his lunch break at Rushmills Industrial Estate in Northampton and the other lucky chap who saw one fly over his garden in Brackley! They were up by 207% from 2017 and up by 344% over the 10 year average. 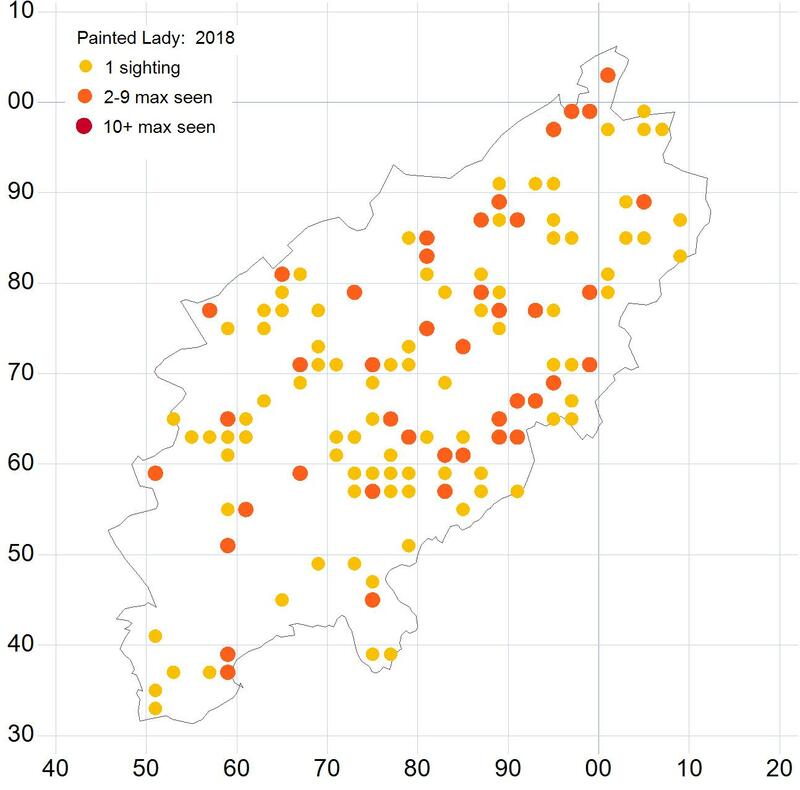 The best site to see them remains Fermyn and Lady Woods for numbers but good counts were also made in Bucknell Wood, Brampton Wood and Salcey Forest. 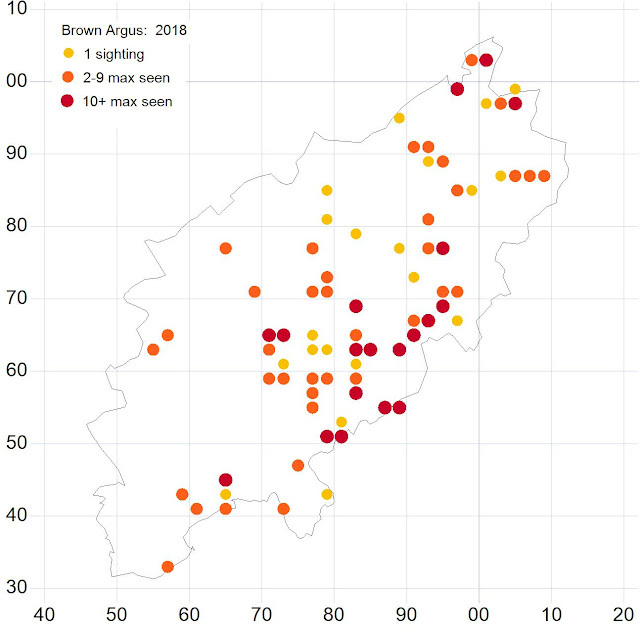 The first of the year was seen on the 20th of June in Bucknell Wood and the last was seen on the 27th of July also in Bucknell Wood. 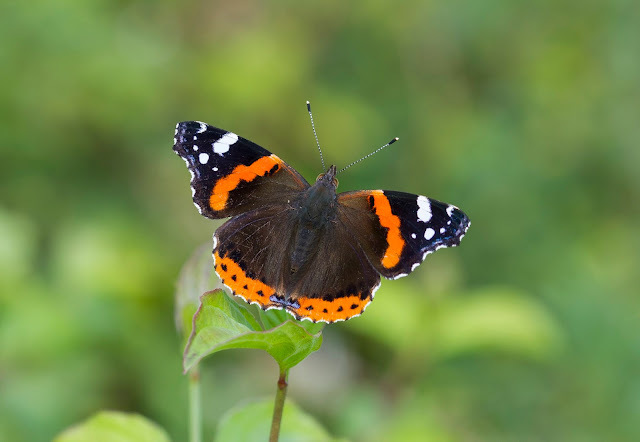 2017 was an exceptionally good year for the Red Admiral so it's no surprise the records show a decline in 2018. Despite this they were still 9% above the 10 year average. 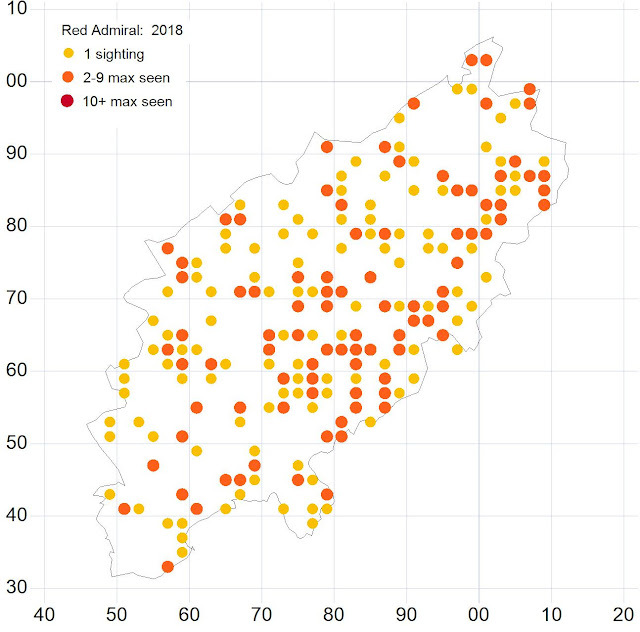 The first one was seen on the 10th of January in Northampton and the last of the year were seen on the 18th of November in gardens in Wellingborough and Thrapston. Although very slightly up from the 10 year average the Painted Lady was down 16% from the previous year but once the Migrant Watch survey results are in this may increase the results. 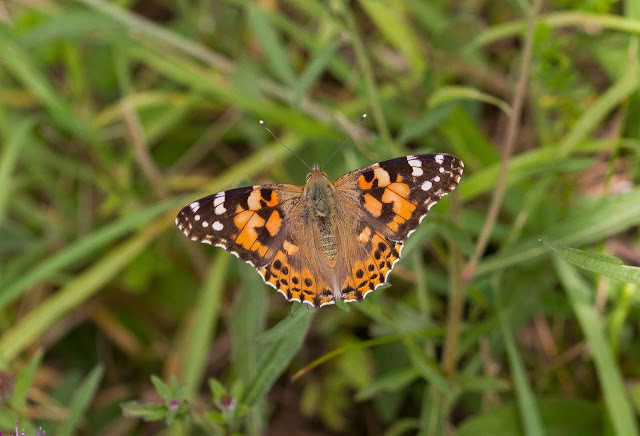 They were seen all around the county although some high concentrations may well be the results of releases from the increasingly popular Painted Lady rearing kits. The first one was seen on the 14th of April at Stortons Pits and the last one was recorded on the 18th of October at Bozeat Quarry. The Small Tortoiseshell was another species that didn't do too well in 2018 but despite being 33% down from 2017 it was still 103% up from the 10 year average. 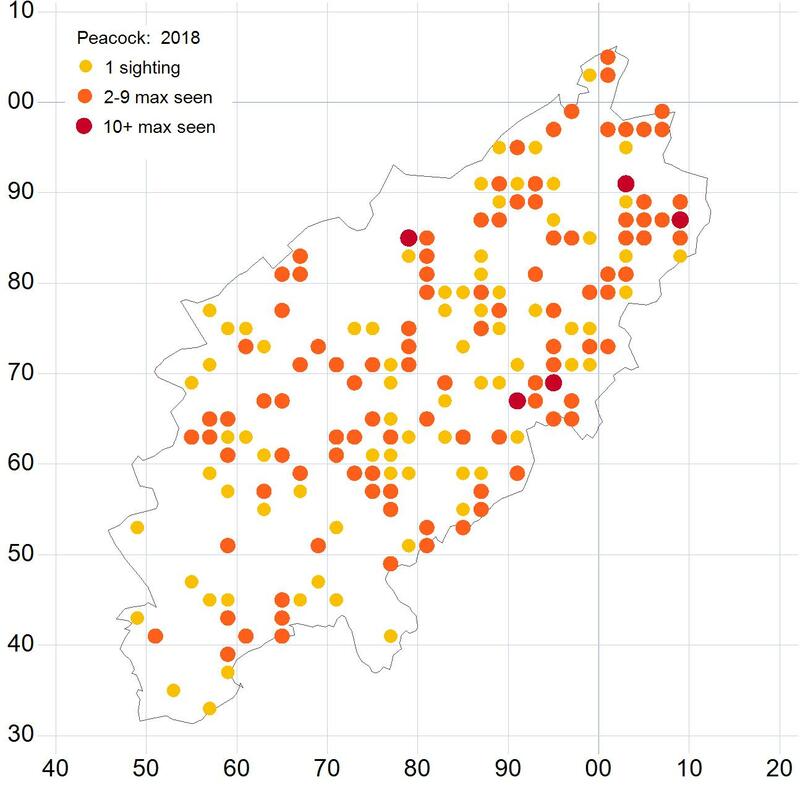 The first ones were seen on the 24th of February in a Kettering garden and Polebrook village and the last ones were recorded on the 4th of November at Pitsford village hall with another woken from it's overwintering diapause on New Years Eve in a Kettering garden. 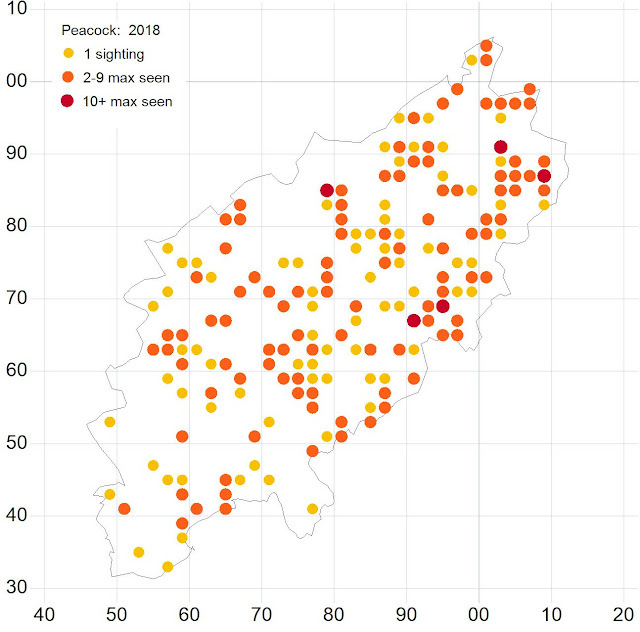 The decline in Peacock numbers has been a cause of concern for a while and unfortunately 2018 didn't show a change in this downward trend. They were down 19% from the 10 year average and 25% down from 2017. The first one was recorded on the 28th of January in a pub garden in Chacombe and the last was seen on the 30th of December at Kinewell Lake near Ringstead. Although 33% down from 2017 the Comma was 82% up from the 10 year average. The species seemed to have a poor showing at the start of the butterfly season but they had a resurgence in numbers by the end of summer. The first one was seen on the 20th of February at Blueberry Lodge near Hanging Houghton and the last was recorded on the 5th of November along the old railway track near Stanford Reservoir. We had more records of Dark Green Fritillary than previous years and at a few different locations too. They have been recorded at Ring Haw regularly for a few years but in 2018 they were seen at more sites which hopefully indicates an attempted colonisation. The species was once again recorded at Ring Haw and also in the nearby Old Sulehey Wood, Great Moreton Sale, Ravensthorpe Reservoir, Polebrook Airfield and at two locations in Fineshade Wood with egg laying behaviour observed here too. The first of the year was seen on the 18th of June at Ring Haw and the last of the year was seen on the 24th of July also at Ring Haw. 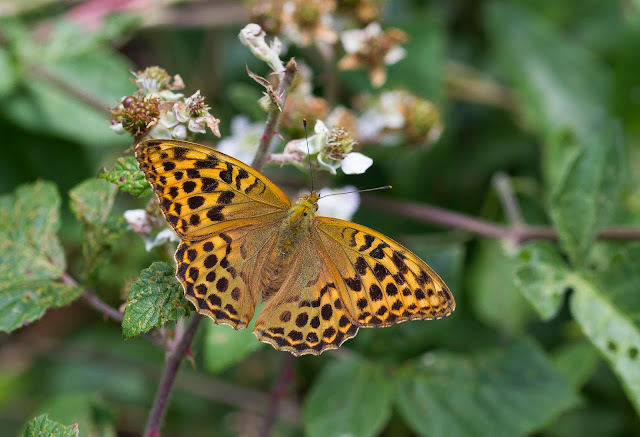 The Silver-washed Fritillary also had a good year and were 61% above the year before and 608% above the decade average. 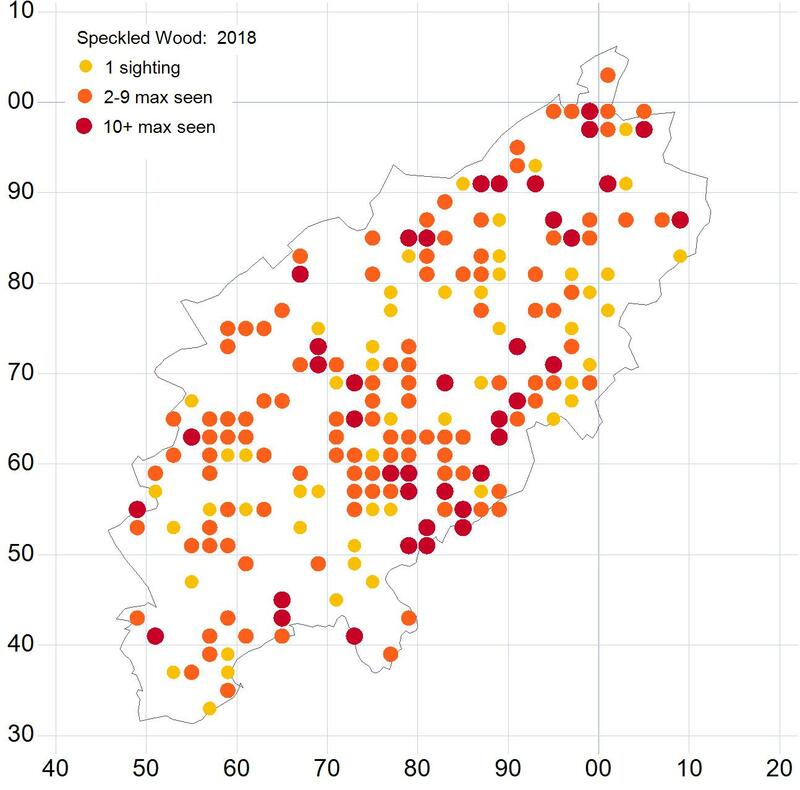 The best places to see them remain the chief strongholds such as Bucknell Wood, Fermyn Wood, Fineshade Wood, Great Morton Sale, Hazelborough Forest, Old Sulehey Wood, Wakerley Wood and Salcey Forest although they could be encountered in most of our woodlands with new sites added in 2018. The abundance of Silver-washed Fritillaries also produced some nice aberrations and once again the colour form valezina was encountered regularly. 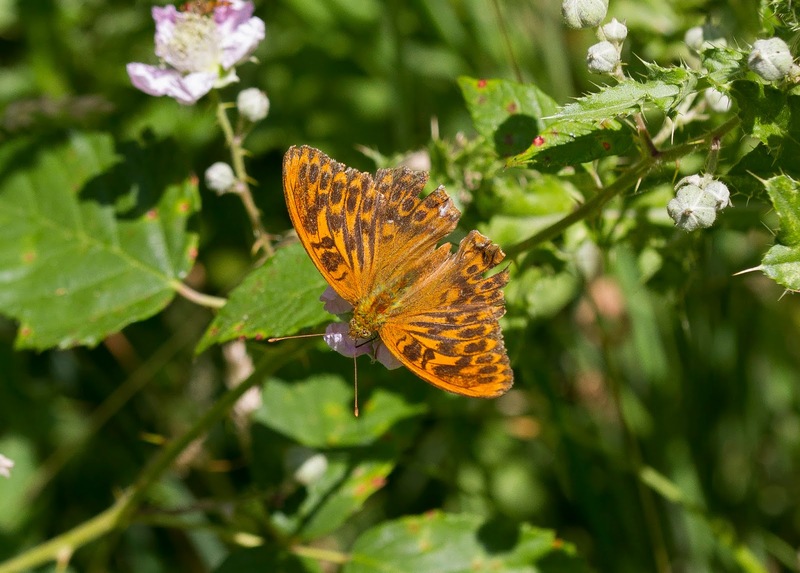 The first ones of the year were seen on the 18th of June at Bucknell Wood and Fermyn Wood and the last of the year was recorded on the 15th of August at Great Morton Sale. The Speckled Wood had a good year and were up by 60% from 2017 with a 238% increase over the 10 year average. The first one was seen on the 14th of April in Towcester and the last records of the year came on the 22nd of October at Farthinghoe Nature Reserve and Sywell Country Park. The Marbled White was seen in better numbers than the previous year and show a 73% rise over 2017 and a 260% increase over the 10 year average. Once again the species appears to have spread in the county with records coming from new grassland sites. 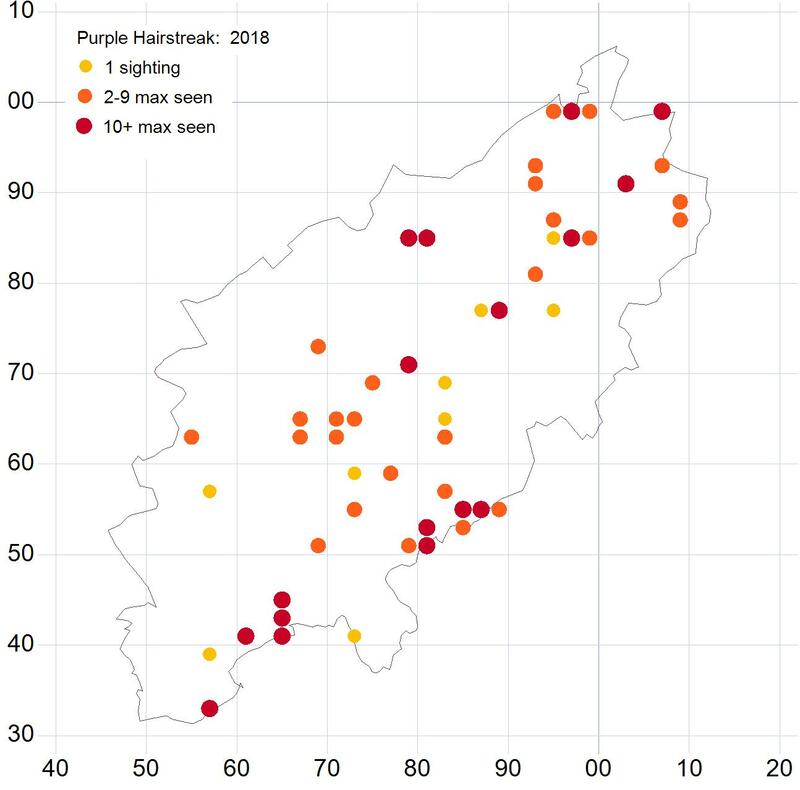 The first ones were seen on the 15th of June at the New Duston Estate in Northampton and at Twywell Hills and Dales and the last one was seen on the 7th of August in Paulerspury. The Gatekeeper numbers stayed about the same as 2017 with only a 0.05% decrease in records but were still 149% above the decade average. The first of the year was recorded on the 24th of June on a Yelvertoft allotment and the last of the year was seen on the 25th of September at the Nene Washlands Reserve. 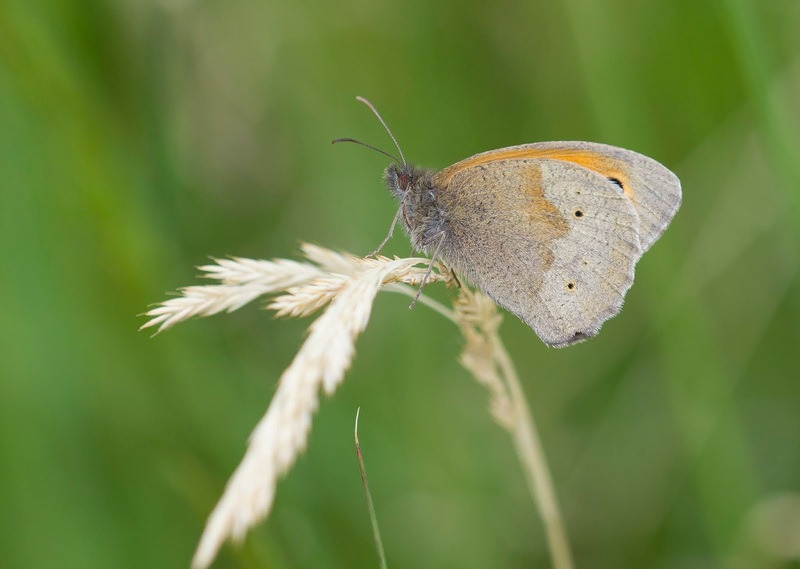 The Meadow Brown had a slightly better year than 2017 and along with the Ringlet remains one of our commonest butterflies. They were 33% up from the previous year and 226% above the 10 year average. 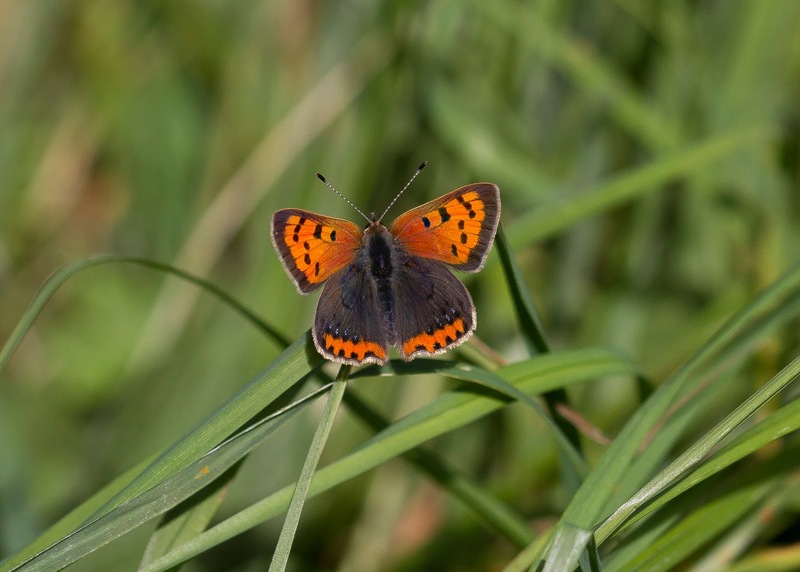 The first was seen on the 1st of June at Summer Leys and the last was seen on the 1st of September at Ring Haw. 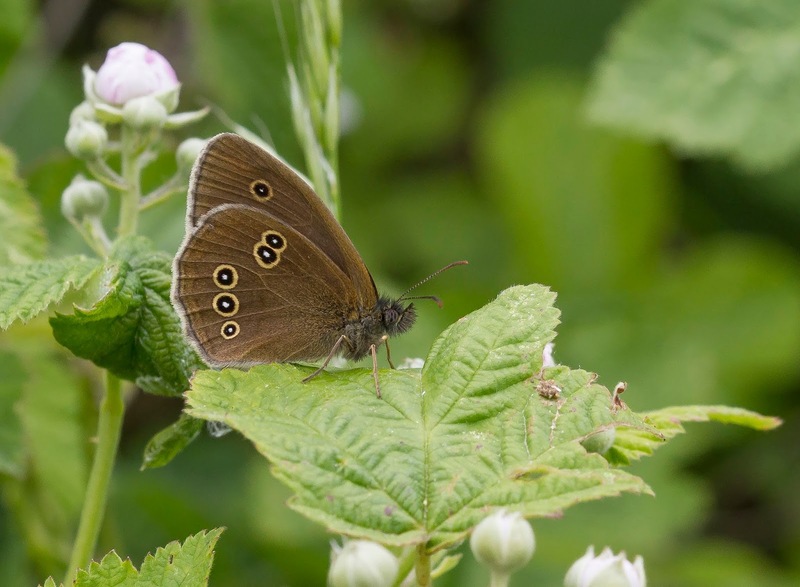 The Ringlet had a good year in 2018 and were 431% up from 2017 and 263% up from the decade average. I think they may have been a victim of their own abundance during 2017 though and were under recorded by our surveyors. 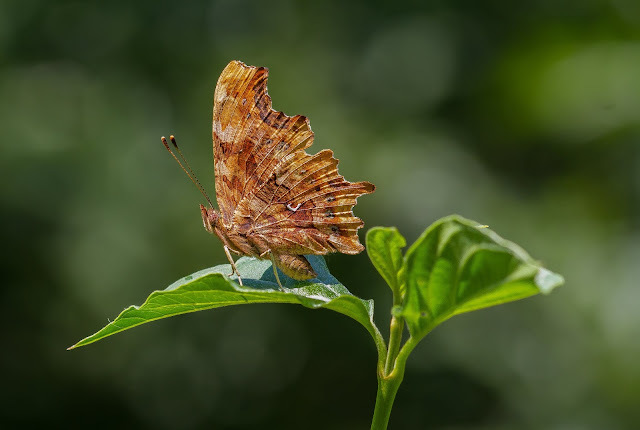 The first one was seen on the 11th of June in Sulby Gardens and the last of the year was seen on the 5th of September in a Daventry garden. The Small Heath also seemed to have a good year too with a 63% increase from 2017 and a 250% from the 10 year average. 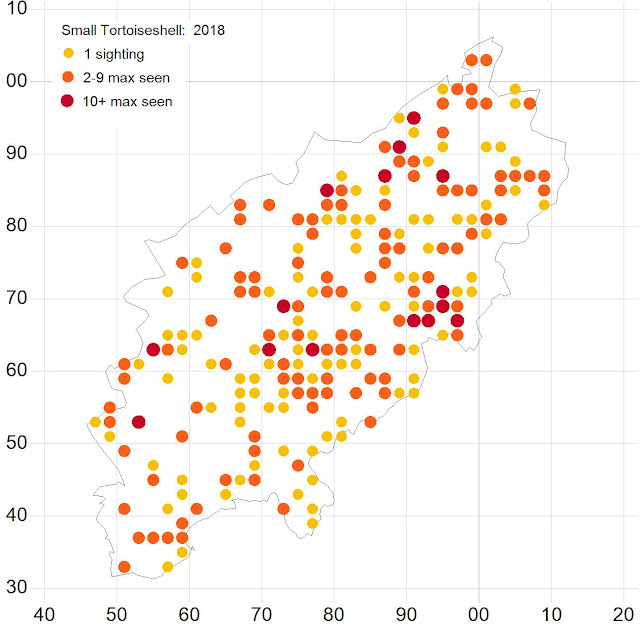 The first one was seen on the 13th of May at Twywell Hills and Dales and last ones recorded one the 29th of September at Ring Haw and Twywell Hills and Dales. So that concludes the brief review of the 2018 butterfly season here in Northamptonshire. The only record we received of an exotic butterfly was a Monarch seen and photographed near Finedon on the 19th of May but this is no doubt the result of a home reared release. 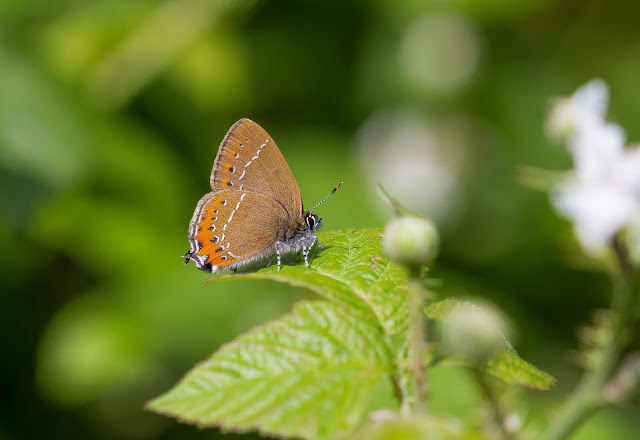 We did also get two tantalising records of Brown Hairstreak at a couple of sites but unfortunately the presence of the species couldn't be confirmed at either despite thorough searches. 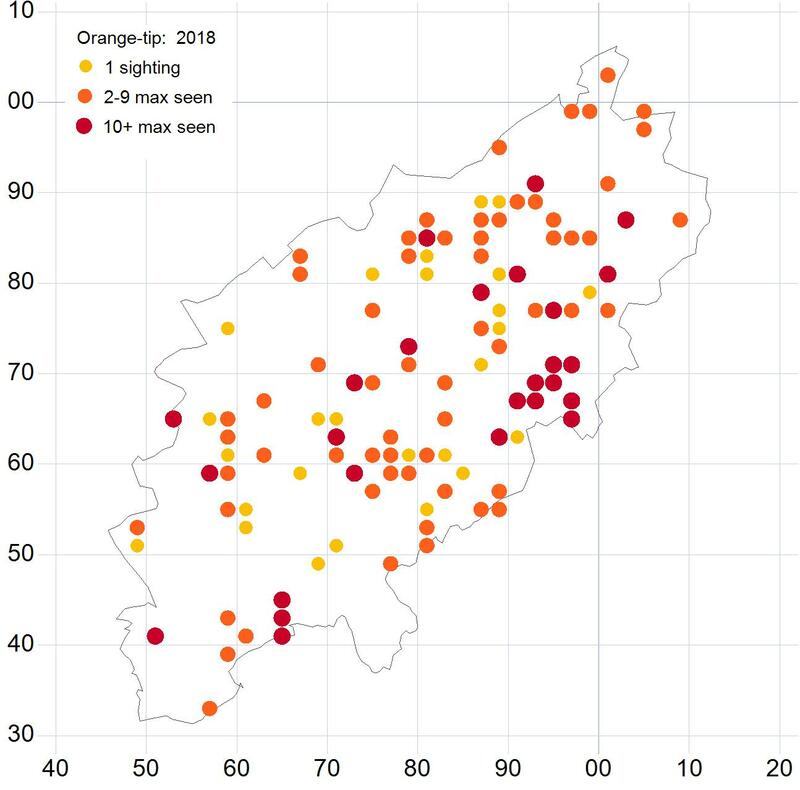 The fantastic work neighbouring Butterfly Conservation branches have put in with egg searches does show the Brown Hairstreak is getting very close to the Northants border so lets hope they push a bit further and we can have a new regular species! 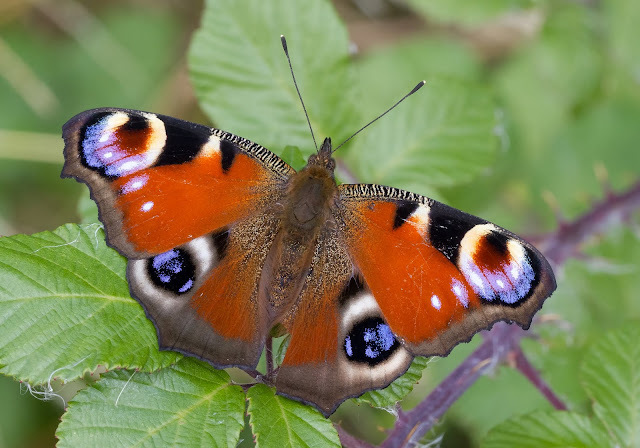 I think it's also worth mentioning that some of the sites mentioned in the species details above are private so please don't trespass to see a butterfly as there are public sites to see all species. Some of our recorders have arranged permission from the landowners to survey selected private sites but these may be retracted should too many people trespass to see the butterflies and therefore we will loose valuable records. In short please don't do what the chap below is doing unless you have written permission to do so! 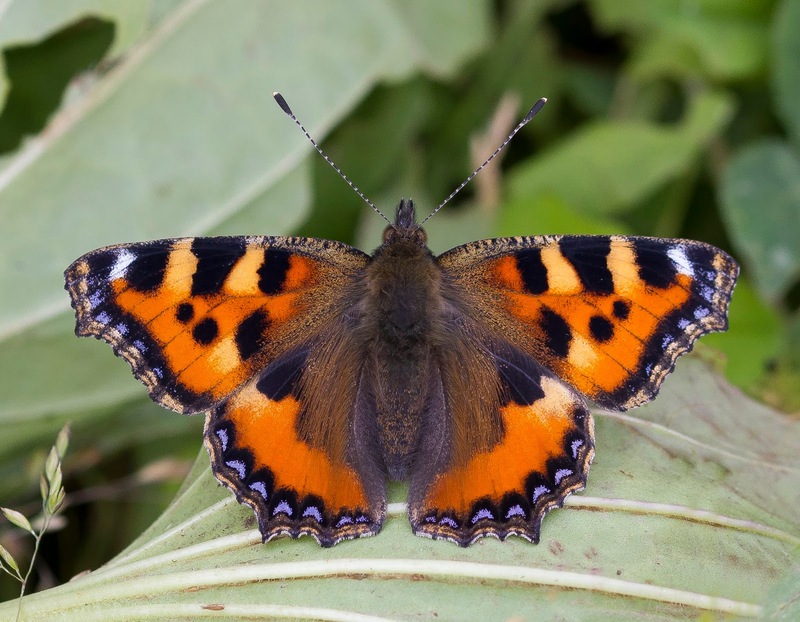 Well done Dave, a great account of the Northants butterfly year, keep up the good work and everyone will hope that the on-going projects are successful.